At last! After only a month and a half post-event, you get to see The Dress. But first, Teslacon was amazing- a wild ride for sure!- the type of ride you’re not sure if you’d go on again, but you wouldn’t trade the experience for the world (partly because you can’t anyway). I caught up with many friends, paraded many outfits, and did much people-watching and enjoying of other outfits. AND…. yes, I finished the green dress. It was completely reinvented from my original post due to the time crunch and the weight of the fabric. I may end up making a velvet and fur trimmed cape or mantle at some point, since I have so much left. But, not to meander from my point…. First, I finished the skirt (recall, it was on the dress form that was set to my corseted measurements, and with the corset, bustle and petticoat I planned to wear also in place so that all fittings would be accurate to how it would be worn). I also set the height to reflect the shoes I planned to wear with the outfit. Since I knew the back of the jacket would cover the opening at the back of the skirt, all I needed to do was choose how to decorate the hem. I decided on something relatively simple- a wide velvet hem with a piped edge. I made the velvet piping first, and I’ll admit to NOT making it on the bias, simply because the application would not be curved. Saved a bit of time. Next I was on to the jacket! As mentioned in the last post, I chose a jacket I’ve made before since the mockup was already done and ready to go. I made some adjustments as I laid out the pattern, based on the differences I knew I wanted for the back of the jacket. After cutting the fabric and lining, I stitched them and ironed the seams, then checked for fit. 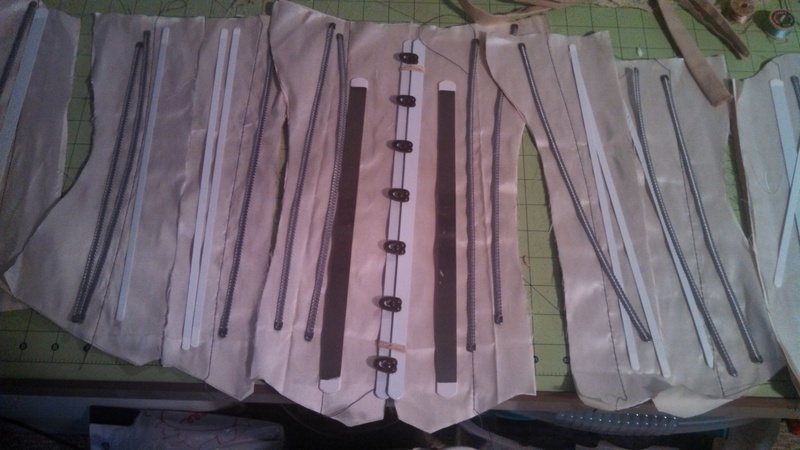 It looked good, so I moved onto laying out the boning for the interior of the bodice and whipstitching them in by hand. 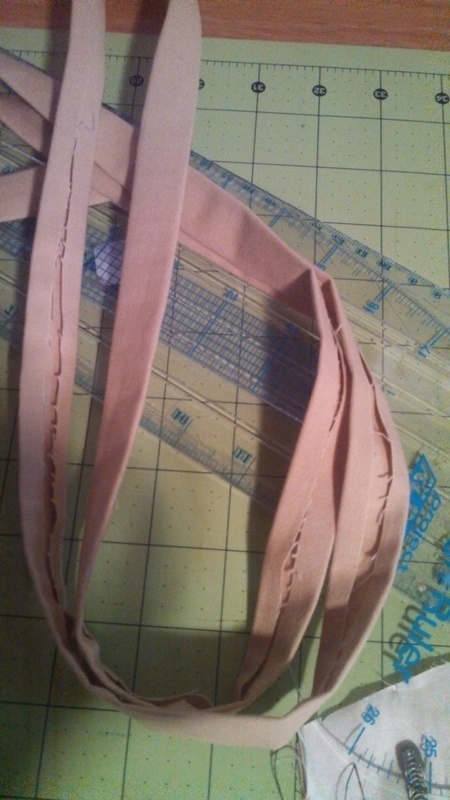 Boning your bodice is important, as it will help hold the shape and resist bunching. 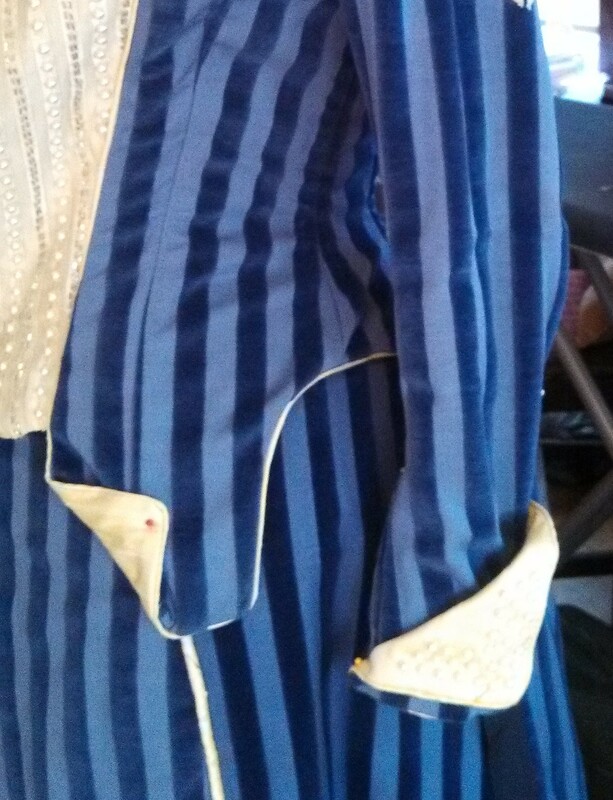 As you can see in the last image above, I had set the sleeves in after stitching in the boning channels. I (planned for) used two pieces of the skirt’s velvet hem for the cuff decoration on the sleeves, stitched in the lining and then basted the two layers into the armhole. I checked placement and fit, then stitched the sleeves on. I had bought decorative buttons for the jacket front and cuffs, but those went on last. I lined the underside of the jacket’s tail in velvet, and also the collar and a band down the front (I stitched in a spring steel 1/2″ bone to add stability to the front closure. A thin band of velvet edges the bottom of the jacket, stitched in and hidden beneath the lining. 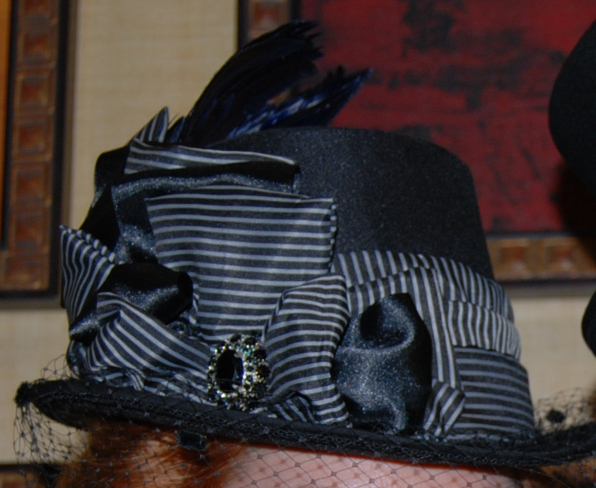 With the simplicity of this look, in addition to the felt hat base I’d purchased, I decided to style the hat and final look along the lines of a “Victorian meets 1940’s film noir” feel, complete with asymmetrical, sassy mesh veil on the hat. In addition to the four buttons I found in an antique store (LARGE silver buttons with a blue-grey background and a latin motto which translates to “there is no room for more than one king in the world”) I bought seven small ones to match that I found on Etsy. I always like to have special details on the back of my outfits, so in addition to the velvet revers and button, I added a silver celtic knot that was once a vintage shoe clip to the small of the back, and an embroidered set of silver laurel branches to signify victory. For extra sass, I planned a plunging neckline to be accented by my rhinestone bra. Because it doesn’t have to be period! 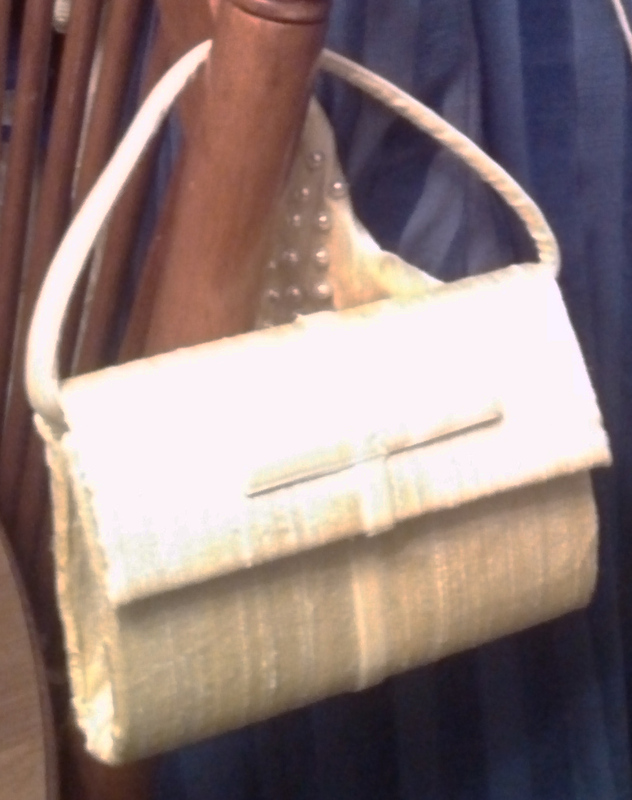 I paired it with the small purse I made to accompany my green velvet ballgown several years ago, and added a fun steampunk accessory on my forearm. Thanks for keeping me company on this journey into procrastination… I’ll come up with a new project soon! Oh god. I started my skirt nearly a month ago. The convention is in a week. One week ago I determined that my prior dress design would not work. The original plan was a big ol’ overskirt because I have SO MUCH fabric. Usually, that’s a celebratory thing- you can do ANYTHING with it. However- this fabric is very heavy. I would have had 12 pounds of skirt. And it’s so thick that a skirt and over skirt would’ve added at least an inch to the waist and I’m just too vain for that noise. The original design called for a brand spankin’ new jacket design with all sorts of unusual features, based off the leather jacket worn by Miss Peregrine in the self titled film. Instead, I’m using a pattern that has already been mocked up, adjusted and sized. Timesaving galore! The color scheme is elaborate, and with the right amount of detail would work, but not with this pared down design. Then I remembered that I have yards of dark green velvet leftover from the ballgown I made with it several years (and Teslacons) ago. Calmly ironing the seams open, isn’t that great? I have a lovely base skirt. Let’s get a side view. Okay, wonderful. Time to start on the overskirt. Ohhhh, crap. This fabric is way to heavy and thick for a 6 yard overskirt. Maybe just a nice pleated fall of fabric down the back? Aw crap- total redesign. I have less than two weeks…. I’ve made this pattern before- it’s ready to go! ?Movin’ movin’ movin’, let’s cut out the fabric and lining at the same time! Yes, get it onto the sewing table already! We’ll use the dark green velvet for trim, screw the color scheme. Make piping with it and get it on the cuffs! 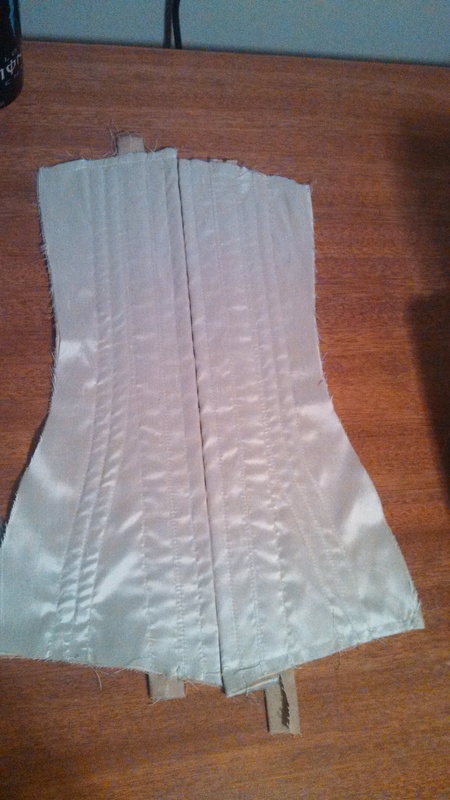 Okay, bodice is ready for boning and trim, sleeves are ready to be inset. 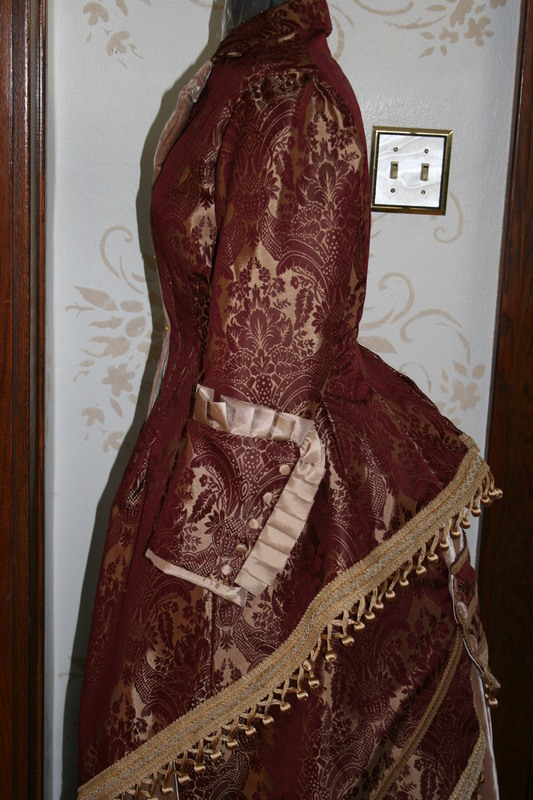 I even have a design plan for the back, and matching velvet trim pinned onto the hem of the skirt. 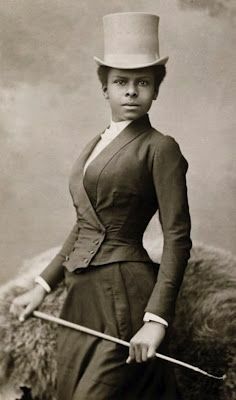 In preparation for Teslacon 7, the grand journey to Paris circa 1884-ish, I’m designing several looks inspired by the period for the Teslacon Fashion Show. I decided to make three sets of corsets and bustles, and two or three new petticoats to serve as foundation garments for some of the looks. 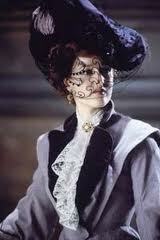 The corsets and bustles were made from a champagne/golden taffeta embroidered with fluer de lis… so appropriate! 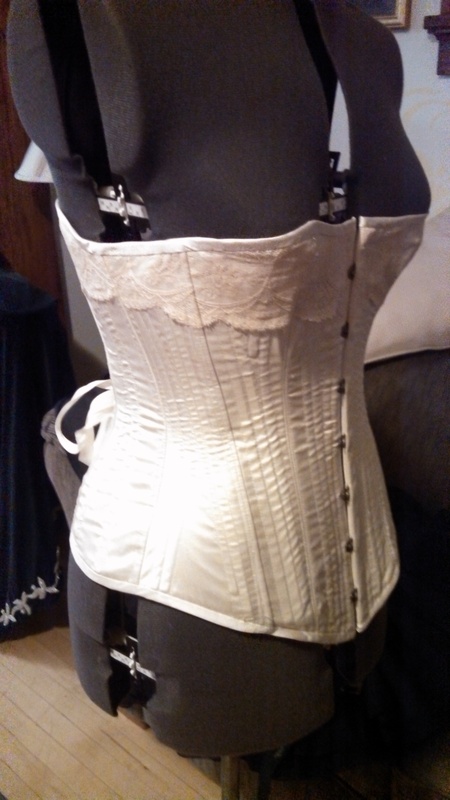 I made two double layer corsets with interior boning channels and closed fronts, and one triple layer corset with boning channels sewn into the layers, lined in ivory silk and with a front busk. A matching bustle accompanies each corset. 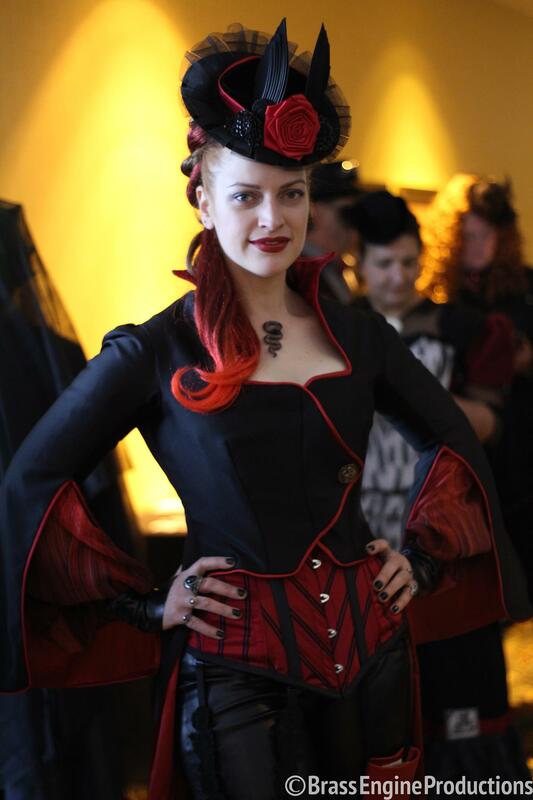 I’ll keep the front closing corset and one bustle, and if one of my models from the Teslacon fashion show wants to buy their foundation set I’ll offer a good-buddy price. 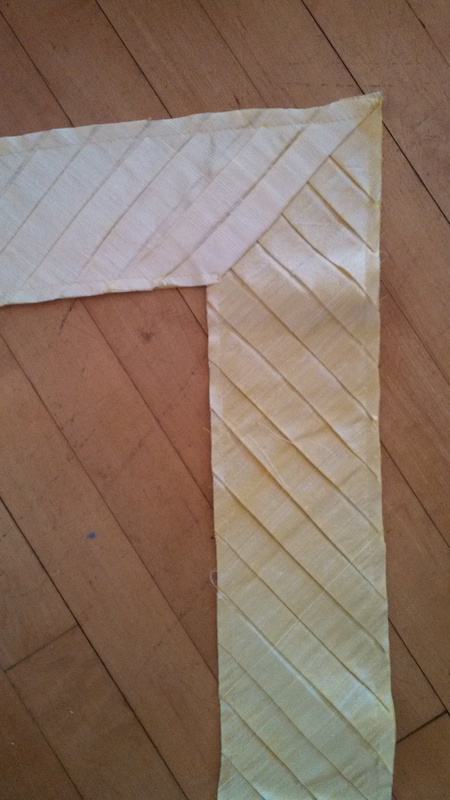 I made my own bias tape for the edging, 1 1/2″ strips cut at a 45 degree angle. Thought it would be lovely to make matching petticoats, but when I searched for this fabric online I couldn’t find it for less that $20/yd… and I just know I didn’t spend that when I got it… either at the Discount Textile Outlet in Chicago or at a JoAnn Fabrics with a coupon, I don’t recall. In the meantime, the foundation garments for the Highborn Collection are done, and I’m on to the first gown! This costume was quite cheap to make- the striped material was from the clearance rack at the fabric store, the jacket was a thrift-store find, and the other fabric and buttons were pulled from my extras bin or purchased on sale or with a coupon (40% off, just sign up for their mailers at JoAnne Fabrics). It was inspired by the very first outfit we see Gillian Anderson wearing in “The House of Mirth”, stepping out of the mist, sihouetted by the steam hanging in the air of the train station. 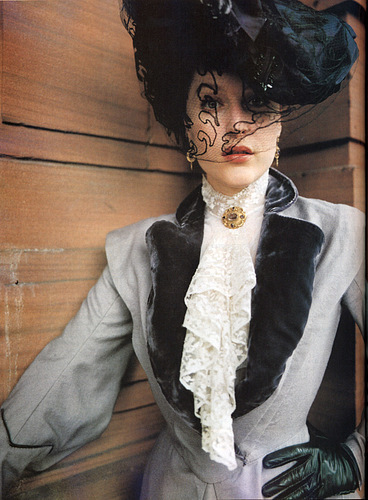 It’s not a copy, but I wanted to capture the romance of the lace jabot, the drama of the tailored jacket with its tiny waist, the luxurious touch of velvet and the hint of mystery imparted by the net veil. My black and grey striped material was synthetic, I believe a striped polyester, and was very easy to work with. I went back a couple weeks after buying it but was unable to find more. 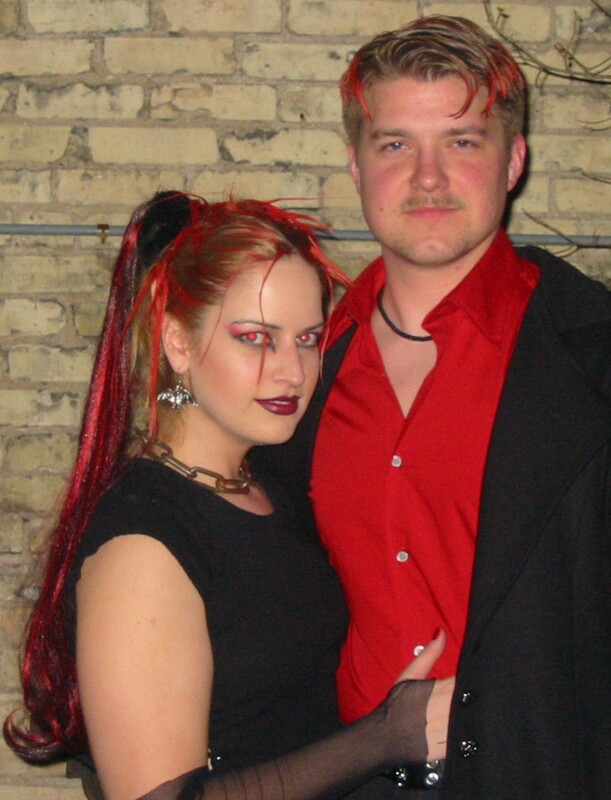 The velvet jacket was probably from the 70’s, purchased at the thrift store, and had a nice sheen and a notched collar. I added some darts to really curve it around my (corseted) waist, and I cut the hem in order to give it a more Victorian shape, finishing it with bias tape. I added some fancy buttons and a couple bands of trim down the front, and that was done! 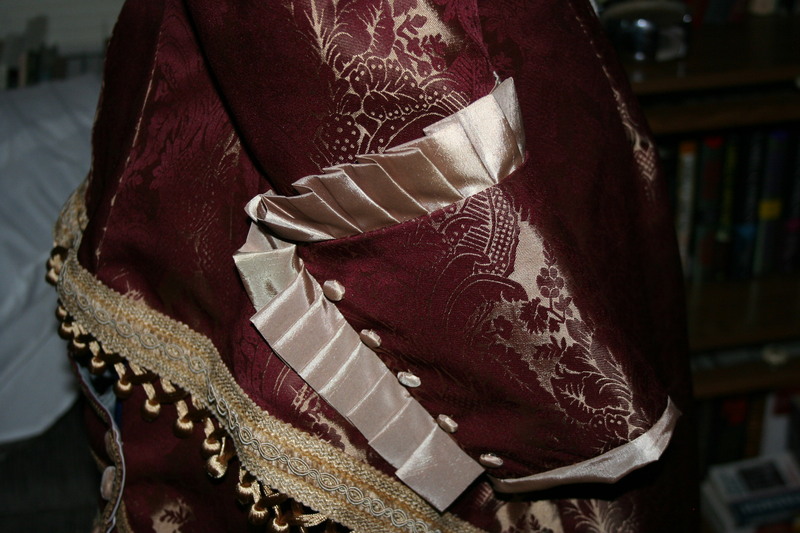 The lace jabot was purchased from the Victorian Trading Co., but I still needed to make adjustments- even pinned to the jacket at the base, it was too flimsy and tended to bunch up and move around on me. Not good if that is serving as your “blouse” beneath the jacket. So I created a base from two layers of cotton duck and handstitched the lace over it….. wait, no, I was impatient, I used a fabric glue. Either way. Problem solved! Honestly, this wouldn’t be difficult to make, if you can find some 2″-3″ lace that you like. All you need is an oval base large enough to cover your desired area, which is attached to a band of lace for the neck (even the store-bought one fastens with velcro at the back), and then stitch on overlapping layers of lace down the base, going from the top down. The skirt was more involved. Again, I didn’t use a pattern. I had a dressform set to my measurements (corseted), and I draped a full-length A-line skirt. The back half I draped from some random black material I had- I wanted to conserve material and the entire back would be covered in rows of ruffles anyway. 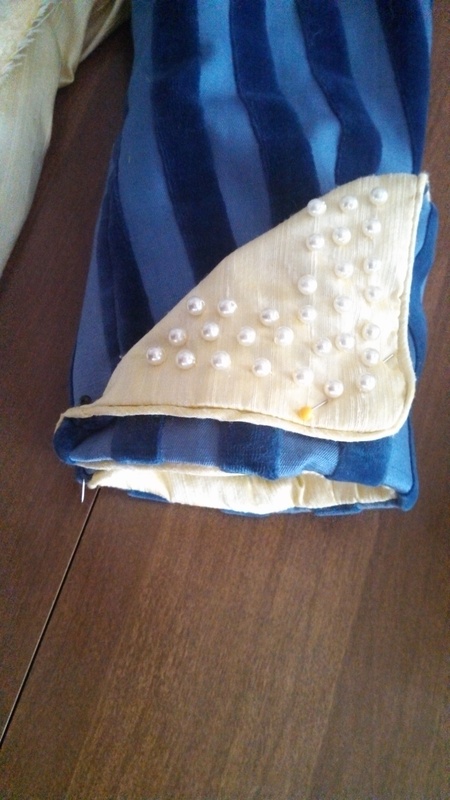 I also made extra deep darts at the back of the skirt to make room for a cage bustle, and then I got to laying out myremaining striped fabric and measuring for a full row of hem ruffle and four evenly spaced rows of ruffles down the back. I cut them, finished the edges & then gathered them. Now, this is before I purchased my ruffler foot so I gathered them all by making a line of large machine stitche along the top & pulling one thread to gather the material along the other thread. In this case, doing it by hand may have been best anyway, as my yardage was limited and it’s difficult to guage how much length you’ll lose with the automatic gathering of the ruffler foot. Once the rows were done I pinned them in place and sewed them in place (no-one will see the top of any of the rows, as the highest one is hidden under your bodice/jacket). There was a dumpy old pilgrim hat that had nothing to lose in a remodel, so I separated the crown from the brim as a first step. 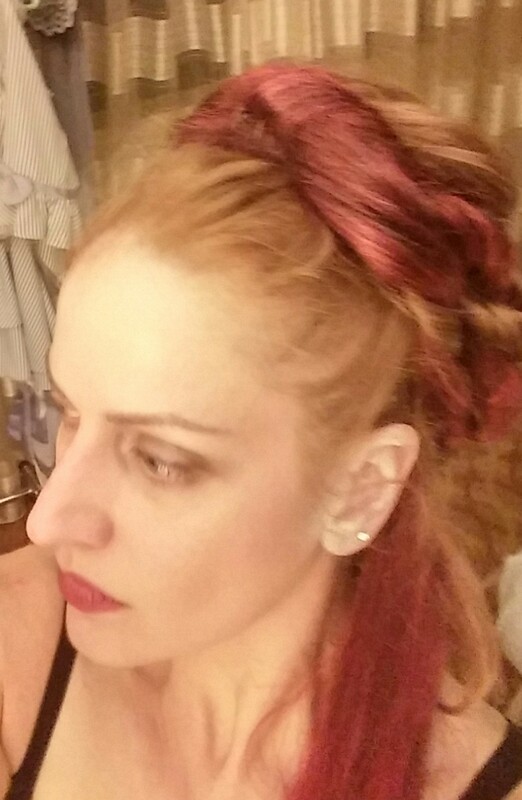 I re-cut the crown to be shorter, and added a sassy curve to the bottom. Then I reduced the width of the brim. I replaced the wire edgeing around the crown and brim, recovered them in a semi-matte black satin, and reattached (sewing and gluing) the brim to the crown. The scraps of striped fabric remaining went into trimming the hat, along with an actual vintage milliner’s pair of raven wings (taxidermied, I’m assuming, though it’s not my forte) and a ridiculously big, sparkly, rhinestone vintage button (also a thrifting find). 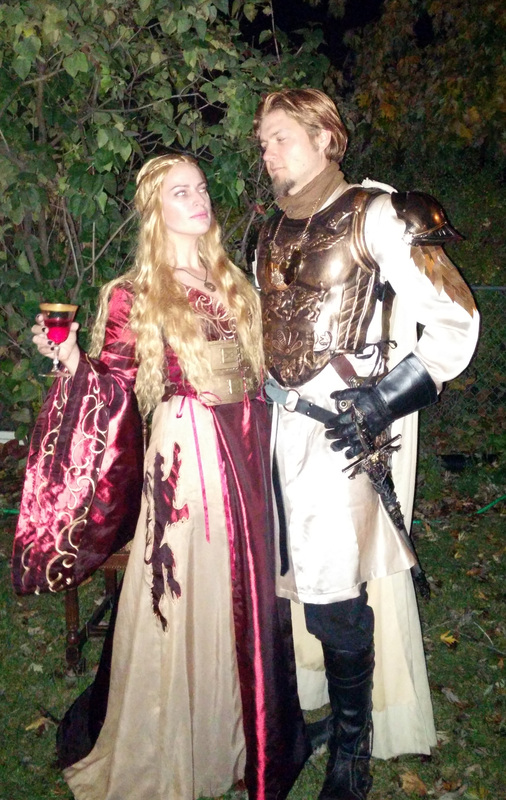 For a costume with minimal expense, I’ve had a lot of good times in it already! I’ve been trying- for the last two years or so- to keep better track of my process while creating new outfits by documenting it with pictures. This blog is an extension of those efforts, published with the thought that someone, somewhere might be interested in knowing how or why they were put together. I’ll spend a few posts reviewing some projects I’ve recently finished (the last couple of years), and they will include projects from scratch, from patterns, draped from inspiration pictures and created from reimagining existing clothing. 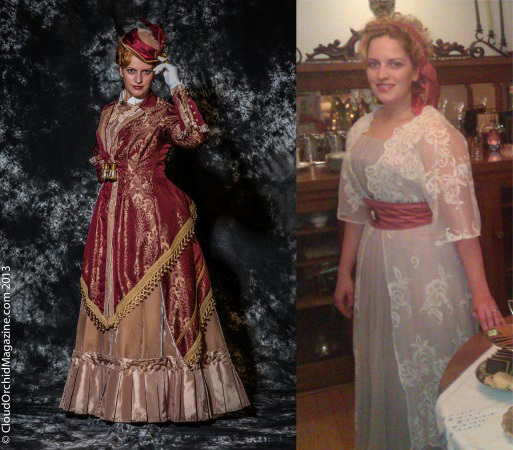 I hope you’ll find it interesting, and for contrast I’ll start with 2 outfits in this post- a very ornate costume built from scratch using historic patterns, and a simpler yet beautiful outfit created from two old dresses. Victorian dress and Edwardian tea gown. Image credit on left: Cloud Orchid Magazine. The humble beginnings of the tea gown. First, the Edwardian Tea Gown. 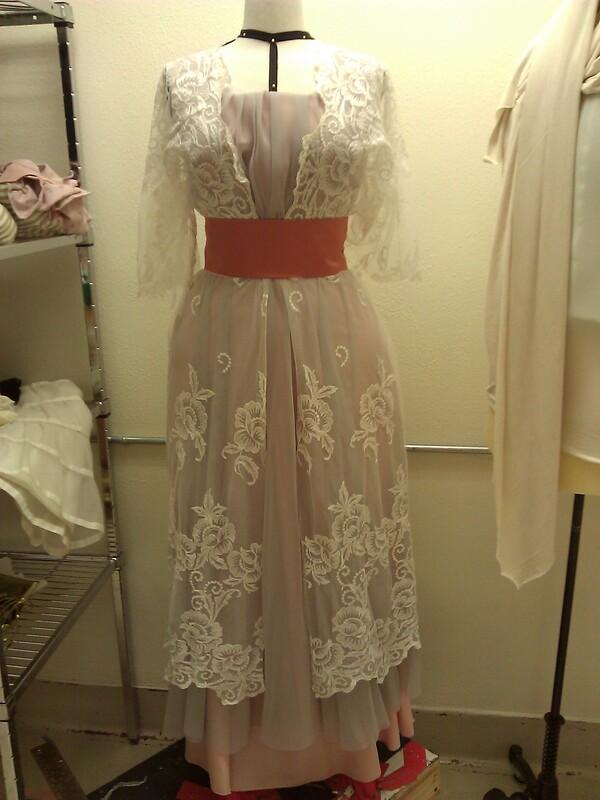 I found this old circa 1970’s dress- likely a bridesmaid dress-with long sheer sleeves and a frumpy ruched neckline. However, it was full length, the colors were right and the fabric was light and pretty, and it was a great fit without any alterations. Well worth $5. 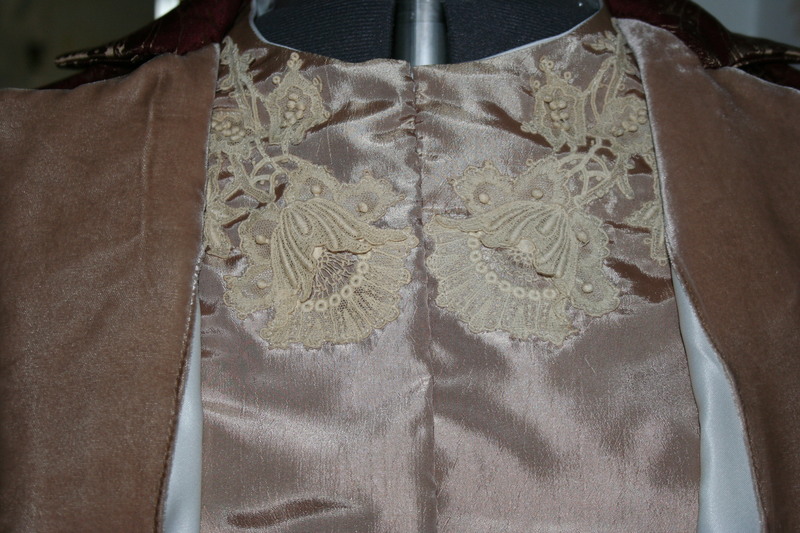 The primary adjustments I made to it were removing the sleeves and creating a square neckline. Not long after, I rescued an old wedding dress from the same thrift store aisles, dejected and rejected because its masses of beautiful cotton-blend lace were stained and ripped in one section. The rescue was brief though, as I just harvested all the lace and discarded the rest. 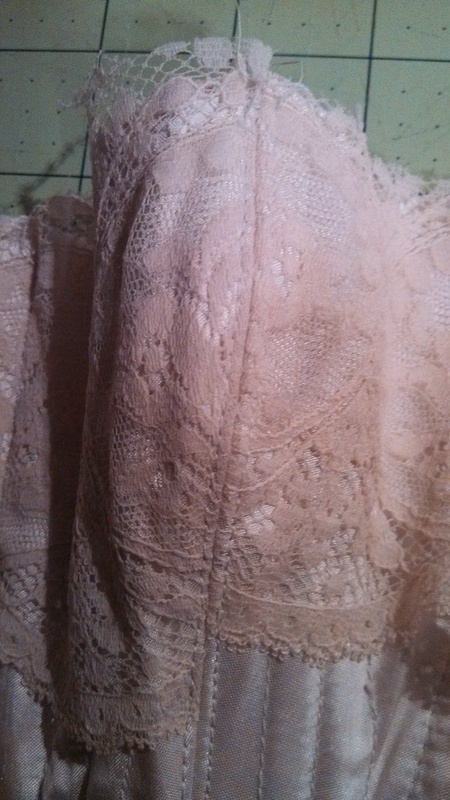 I began draping these lace pieces over the dress. I’d just like to say that the dress was feeling very pretty, and very familiar, but it was only at this point that I searched online for some Edwardian design inspiration, and discovered that this dress was well on its way to becoming a close relative of Rose’s (Titanic) “swim dress”. 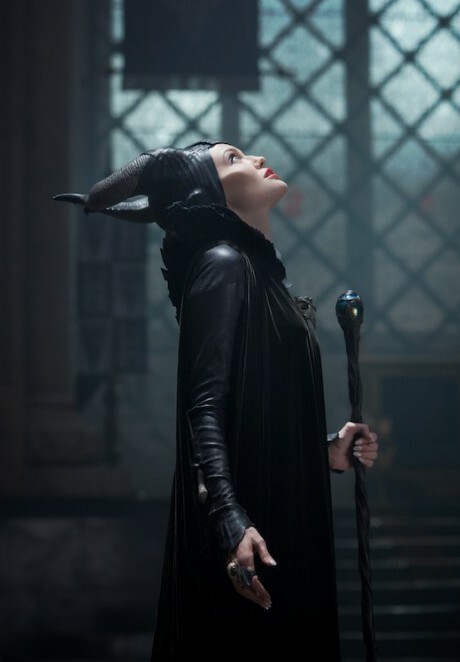 Which I was just fine with- I really admire the costuming work done in that film. 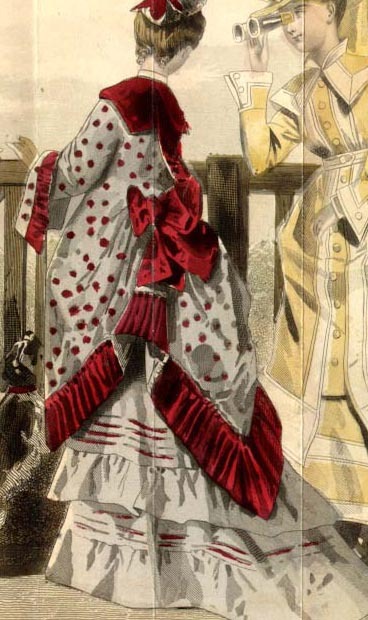 The “swim gown” would have been perfectly acceptable for an informal tea or as a dress for receiving daytime visitors at home. 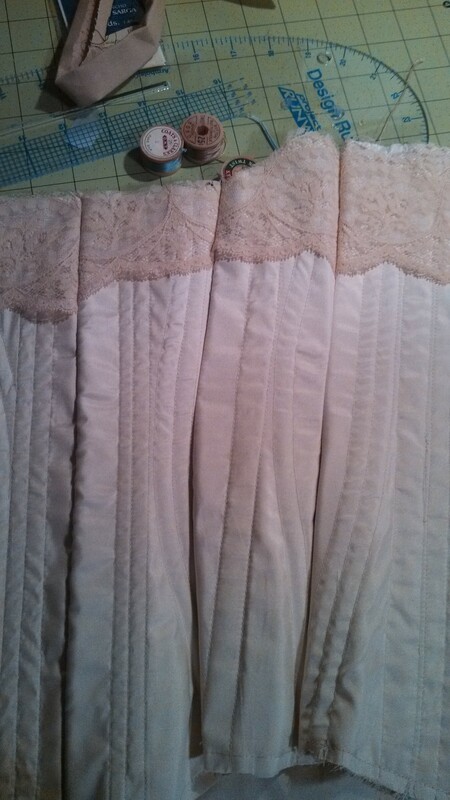 After estimating the amount of lace at my disposal, I cut, pinned and hand-stitched the pieces to the dress. 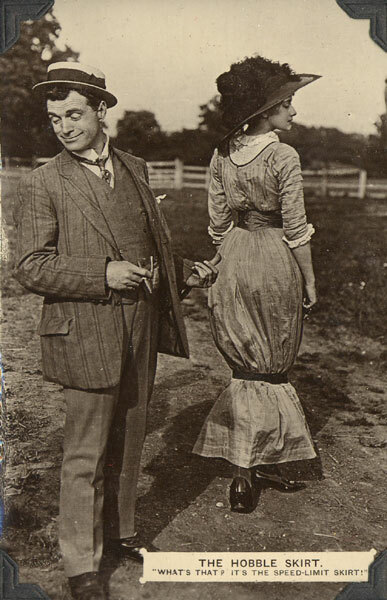 It was looking quite Edwardian, but it needed a wide belt. 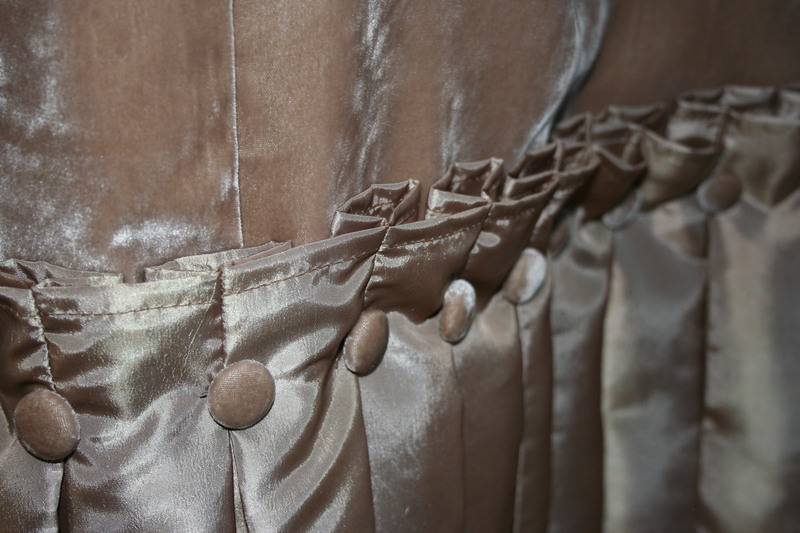 I found a length of satin in a good accent color to make a wide sash for the waist. And that was pretty much it- I went to Etsy to find some oval cabochon frames and purchased a few cameos separately to insert in them, and I put a cameo on the center of the belt and one on each shoe, like a shoe clip. But you can do a lot with a couple of dresses and some inspiration! 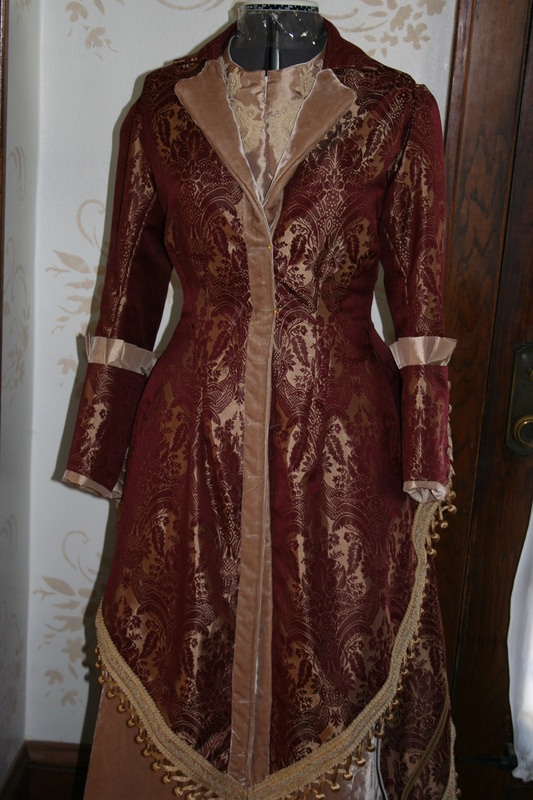 The finished Tea Gown, minus a couple of accessories. Look at those details! What a great pattern! If they were included, that is…. On the other side of the spectrum…. my next outfit was begun by laying out bolts of fabric into pleasing combinations, and mixing and matching them with various patterns I had bought myself for Christmas (I always know just what to get me!). I settled on Ageless Patterns #1687. I tend to like simpler, tailored lines paired with highly detailed, clean decoration, so the wide band of pleating on the skirt as well as the double points on the polonaise and the bustle detailing really appealed to me, along with the notched collar styling on the bodice. 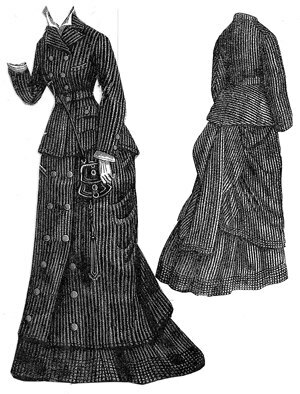 PLEASE note here: It is not stated when you purchase the pattern, but all you get is the basic shape pattern for the jacket- NOT the bustle detail, not the double pointed polonaise- and the basic pattern for a period skirt (not the shown skirt but one similar), NOT the pleating at the bottom, the trim around the edges of the whole thing, the trim around the cuffs, nothing. 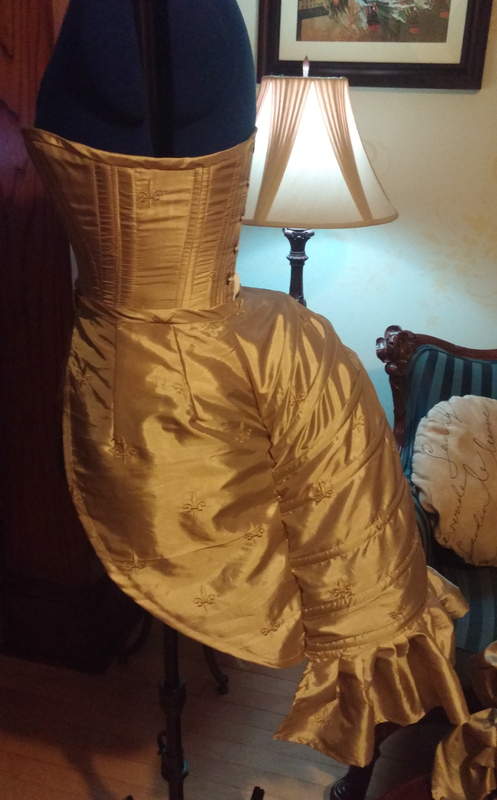 When I contacted the seller, she stated that Victorian clothing is all about decoration and those “decorative elements” are not included in the pattern. I’m sorry, but those are major aspects of this dress, not just decoration. CUT OUT PATTERN PIECES. LINE AND INTERLINE ACCORDINGLY MATCHING NOTCHES AND KEEPING NOTCH 12-27 LINED UP WITH NOTCHES1-12 ASSEMBLE JACKET PIECES. TRIM AS DESIRED. ALL INSTRUCTIONS ARE RUN TOGETHER AND MAY OR MAY NOT INCLUDE PUNCTUATION OR MAKE SENSE. In fact, here’s a pic of the “instructions”. “One peace each”, really? Really. Wow. Such effort. Seam allowances, markings, straight of grain and ORIGINAL sewing instructions have been added. THE SEWING INSTRUCTIONS ARE AS THEY APPEARED ON THE PATTERN AND IS WHAT THE CUSTOMER GOT BACK THEN. Sometimes the patterns have more description and are short on sewing instructions. I have done my best to include all pattern pieces. 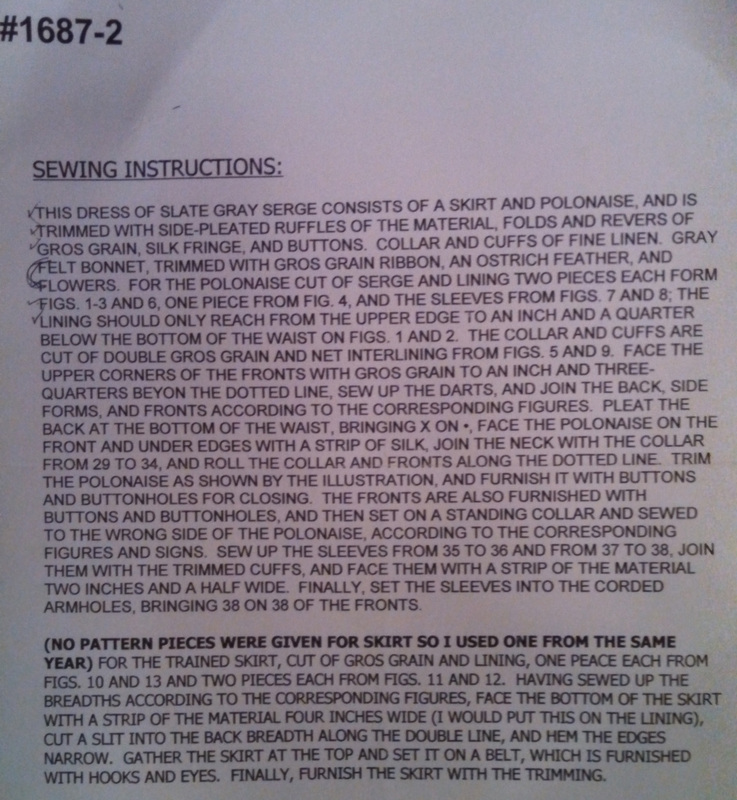 Please read all instructions on the pattern before purchasing fabric and cutting of the pattern. All patterns are sewable, just use your head, a little common sense and patience and your garment will turn out just fine. So, now you can feel inadequate because you should be able to make sense of an all caps run-on paragraph if you just “use your head”. Well, I was able to figure it out (and actually informed her of a mistake on her pattern), but everyone has different levels of experience. And it was very annoying. “What the customer got back then”… well, times they have a-changed, how about updating the pattern to reflect 125 years of advancement? I mean, is it really so difficult to put a TINY bit of effort into this, after you’ve marked the grainline and seam allowances could you provide a few modern sewing hints or, heck, just PUNCTUATION to help us out a bit? After all, after the initial effort, you just run it through your printer & ship it off. They include detailed instructions on resizing vintage patterns, step by step methods for construction, and even instructions on various types of trim you may choose to add to your garment! Imagine that. My recommendation is, if you haven’t fallen in love with a particular pattern from Ageless, STOP right there, and go to Truly Victorian (or buy a Truly Victorian from Ageless, as they somehow sell other people’s patterns on their site, but I would prefer my money go straight to the TV people who put an effort into making the pattern user friendly). 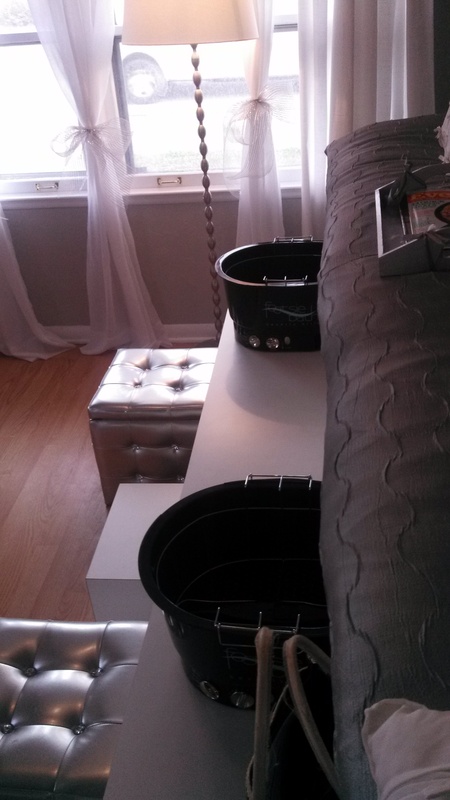 I used a steamer on the velvet to revive the crushed areas- it works, and improved the look 100%! 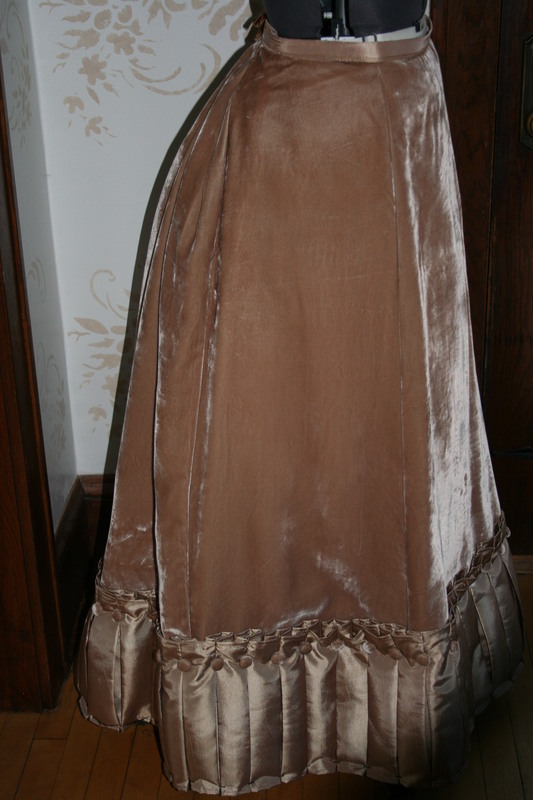 The first step was the skirt- I had a decent amount of this beautiful tan (I think a silk blend) velvet, and I used that as a skirt base. I lined it with a midweight satin and sandwiched a reinforced waistband between the layers. I like to put 2-3 grommets in either side of the waistband back, as it allows the skirt to be adjustable (this outfit can actually be worn without a corset, though I’D never do THAT!). Since a broad band of pleating was going on the bottom I didn’t worry too much about the hem, and sewed in some horsehair braid to help the hem hold the folds of the skirt away from the body a bit. The pleats…. oh, the pleats. For some reason I decided to make box pleats. 4 yards of 18″ wide, 1.25″ deep box pleats, from a shimmery tan “silkessence” polyester material from JoAnne Fabrics. I cut the strips at the width I wanted, sewed them together lengthwise, finished the edges, and then started with the pinning and ironing. 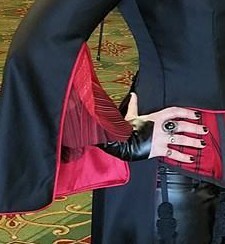 My dear sweet husband assisted with pinning the finished length of pleating to the hem at the correct length with the corset, bustle and shoes I planned to assign to the completed outfit. I hand stitched the hem on, to keep the meeting of the two fabrics totally smooth. I love the box pleats, and I hate them. You understand. * I also stitched the pleats closed by hand with very large stitches, and took the thread out just before the first time I wore it, to keep the pleats sharp. I decided that I should also have a velvet covered button at each pleat. That was fun. (see my post here for a covered button pictorial)Another note- if you add a little dot of hot glue between the front and back of the covered button as you close it up, the chances of the cover falling off sometime in the future are greatly reduced. I hope. Always hem while wearing the underwear and shoes you always plan to wear with it- it makes a difference!- My Renaissance outfit needs heels with the Elizabethan corset, while with the Victorian corset I must wear flats. 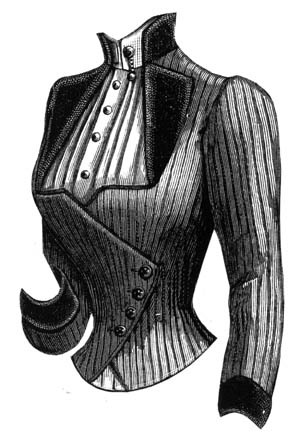 Different corsets emphasize the resting waistline at differing heights. Next was the hard part- the jacket. I did mockups for fit, and it’s a good thing- I lengthened the sleeves and the waist in back, and took up the length of those front polonaise points. 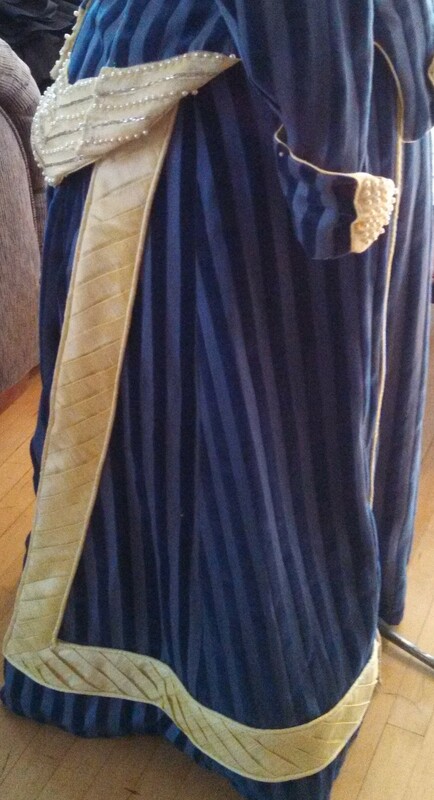 I didn’t want to cover as much of the skirt as the polonaise does on the pattern- not after all that pleating! I created the jacket block and lined it. 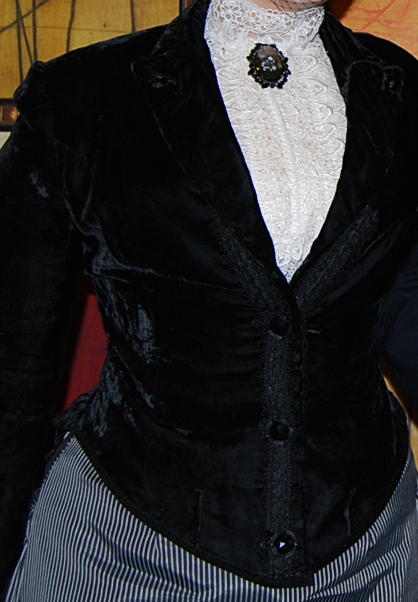 I used the velvet for the lapels and a band of trim down the buttoned front, and used covered buttons in the same fabric here as well. This went well- I reinforced the front jacket band so I wouldn’t get any pulling or bowing from the individual buttons. I applied the vintage lace with a spray glue, then handstitched it on permanently. The pattern comes with a cutout for a dickie, or false vest. I used the silkessence again, and some ridiculously beautiful vintage lace. A spray glue adhered the lace to the fabric well enough for me to use a zig-zag stitch at key points to attach it permanently. (I tested the spray-on fabric glue first, of course) Handstitched the dickie to the inside of the jacket. I cut the bottom points of the jacket front with some extra length on top, to create that double point seen on the pattern cover, and cut two rectangles big enough to span the distance from one side to the other. I pinned, repinned, and marked where the pieces would be attached to the main jacket. The ball trim with the “less gold” band of trim. Then it was all about planning the trimming- I splurged on a gold ball trim and matching band of trim for the jacket hem, but once done it all looked too gold next to the tan of the velvet, so I changed out the band of trim while keeping the balls… it looked much better. My husband said he couldn’t see a difference. The sleeve cuffs weren’t too difficult, I made some knife pleats for the edge and sandwiched them between the fashion fabric and the lining. Just plain old knife pleats- and the buttons are decorative. Trying it on when all was done, I felt like something was still missing. And my arms are really long (thanks dad! ), so I still felt like the sleeves were short-ish. My solution: $5 tuxedo shirt from the rummage room at the Miller & Campbell costume shop + scissors = a striking addition to the collar and cuffs of my outfit. In the full outfit, misbehaving. To finish the outfit off, I added a pair of mother of pearl opera glasses (online auction win) and a coordinating hat (found the velvet base resale, perfect color match, and had it trimmed at The Brass Rooster). Oh, and gloves, of course. 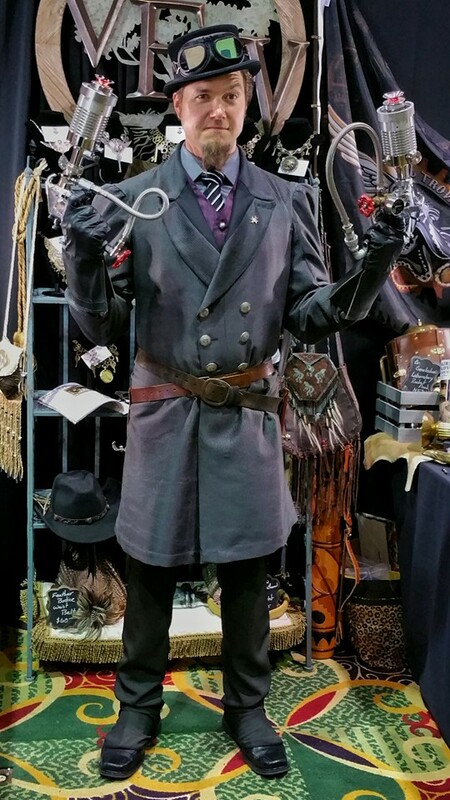 This costume, though just shy of garnering the Teslacon 3 “Best In Show” title, did attain the win for the “Historical Master” division and garnered me the cover and a 4 page spread with interview in Cloud Orchid Magazine’s 2-edition coverage of Teslacon 3. I’m very happy with it, but it was a LOT of work! 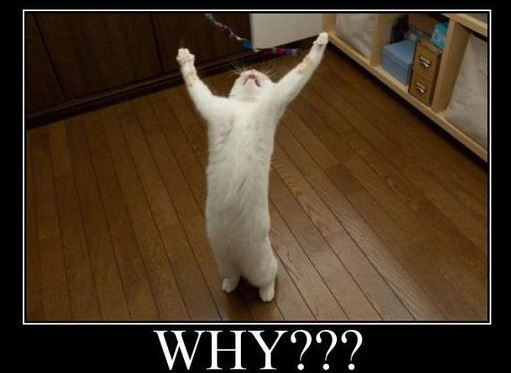 I worked from 9am until about 11pm, excluding a break in the middle. First step, the pattern. 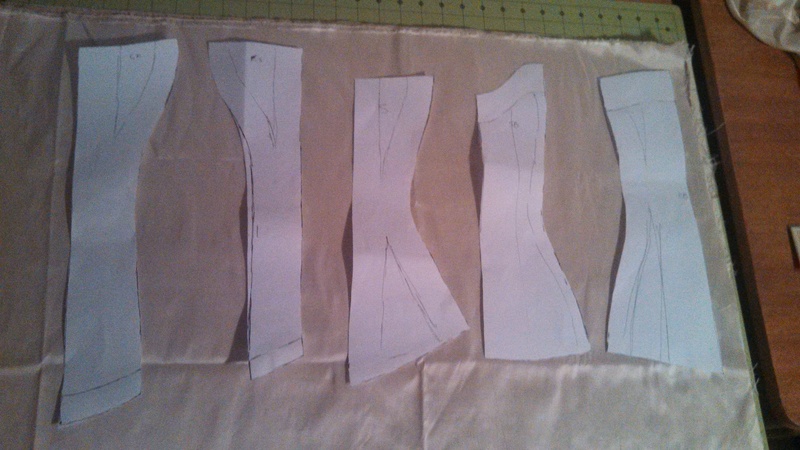 I cut out the original pattern, marking the measurements of bust, waist and hip of each piece. 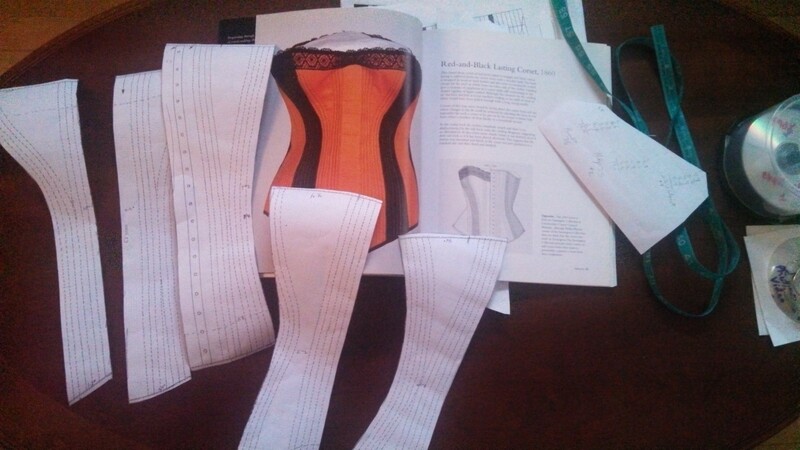 Then I took my measurements (with desired corseted waist # rather than actual), and determined how many more inches would be needed at each section. Then- the hard part- I divided the sections into percentages, and added that percentage of the total increase needed to each piece, halved for front and back. I drew up my new pattern pieces and added seam allowances of 5/8″. This book, “Corsets: Historical Patterns and Techniques” contains corset patterns ranging 3 centuries, all at half size. I scanned them, made sure the scale was correct, then increased the size and had them printed. 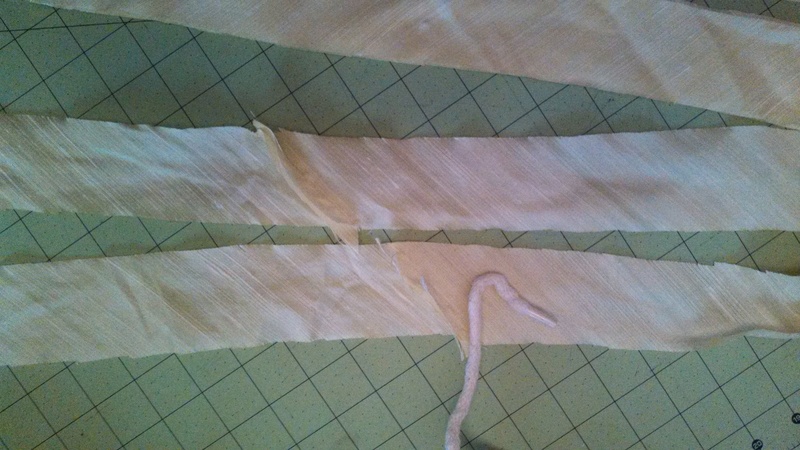 This was the only part done before the corset-making day. What?? I know! The goal is to increase the measurements of your pattern pieces proportionately. If you wanted to increase the overall corset size by 3″ and just added it to the center back, you would end up with hip curves that no longer line up and bust seams that are off and too small. If the waist measurement of the first pattern piece is 2.8″, or 20% of 14″, then you would need to add 20% of the total desired increase to that pattern piece. If you were increasing the waist size from 28″ to 31″, you would add 20% of 1.5″ to that piece. Technically, you would add 10% to the left seam & 10% to the right, to keep it even. It takes some work, but you only have to do it once! Laid out on the grainline of all three layers of fabric. 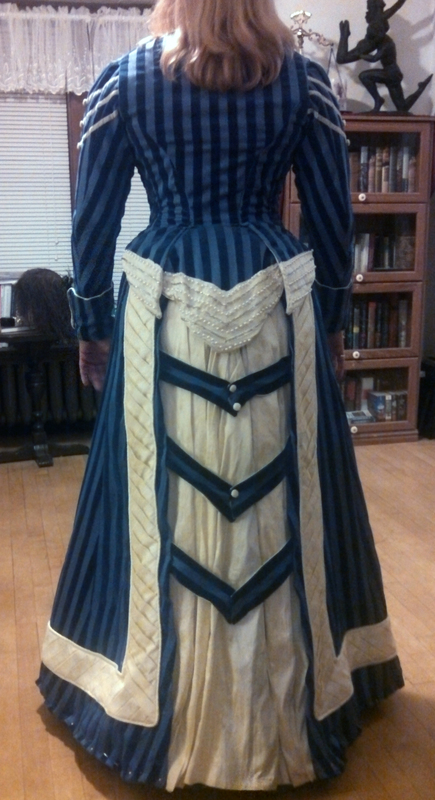 Note that I extended the front of the corset- I like the extra tummy control of a long front. Be sure to curve it back in towards the body just a tiny bit, so the bottom tip doesn’t jut out. And see that I eased the additional amount around the bottom hem, reducing it until it blended at the side hip. Be very sure all your fabric is lying smoothly if you’re going to cut it this way! 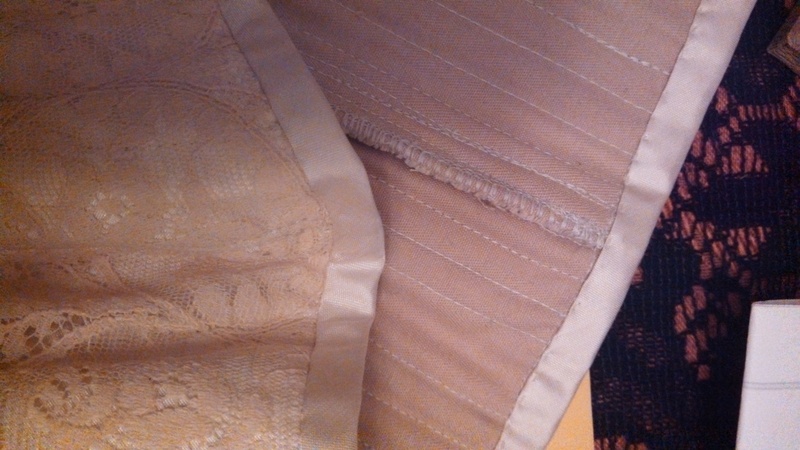 Champagne colored silk, a tea-dyed coutil and ivory twill. In the end I used the twill for the interlining because the silk is so thin the darker color of the coutil showed through. I stitched a stabilizing line down the grainline of each piece in very large stitches to keep the pieces from sliding out of place as I worked on them. 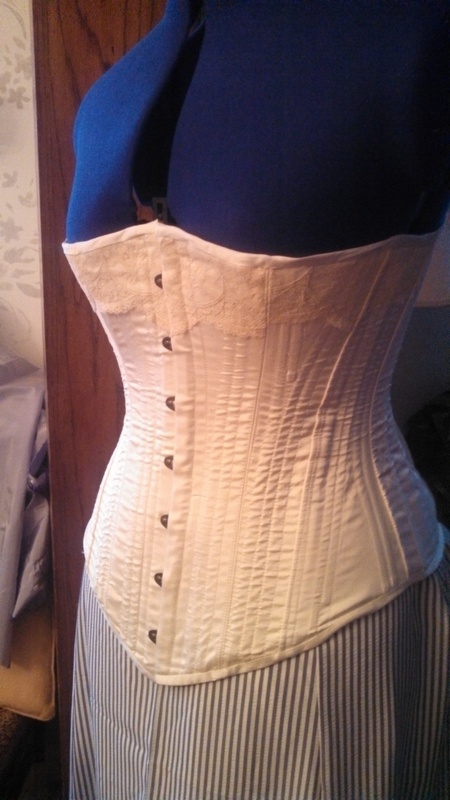 While I would normally do a “sandwich style” corset, finishing with a nice smooth lining, I chose to make an all-in-one-layer corset to save a little time. The bone casing doesn’t have to be cut on the bias, but it makes it easier to ease around those hip & bust curves. I made my own bone casing out of some of the coutil. I have pre-made casing on rolls, but I only have it in black and would normally be hidden behind the lining. For aesthetic purposes, I used the same interior fabric. Since I was sewing the boning channels before the pieces were joined to one another, I needed to plan out what size boning to use, and where. After deciding on lengths, widths and placement, I marked out the channels to be sewn with chalk, following the natural curves of the pieces when necessary. 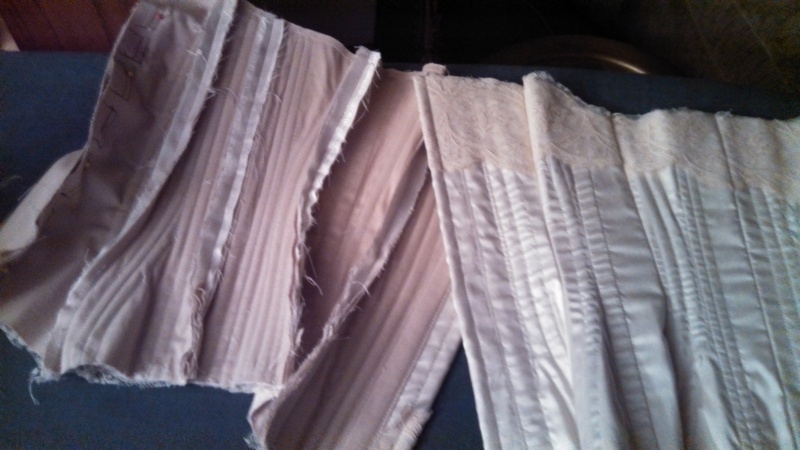 Here are the center back corset pieces, with the center back turned under to create extra layers of stability and a separate bone channel sewn over the raw edge. It is important to set bones onto both sides of your grommets, being as precise as possible- the less possible movement for the boning, the more use you’ll get out of your corset. Plus, the boning reduces bowing and pulling at this high-stress point. Make sure you give yourself enough room for the seams, for finishing the seams, or for adding more bone channels for finishing those seams. Once all the channels were in, it was time to sew the pieces together! I sew the section seams twice, with two different stitch lengths, for strength. 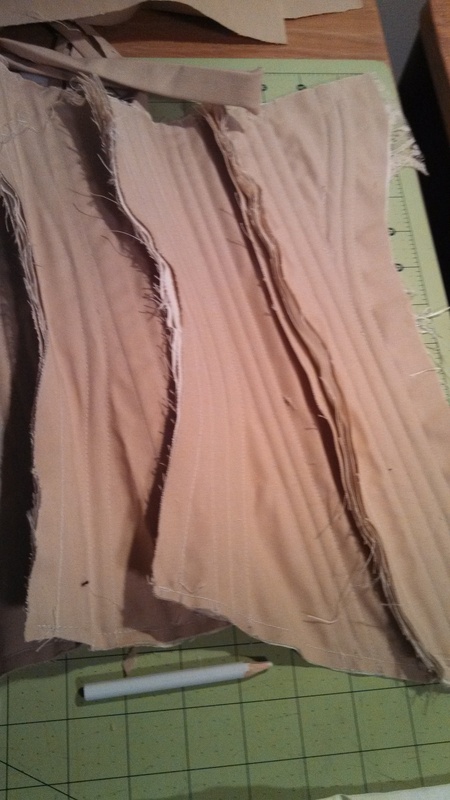 I sometimes trim up the top and bottom edges to smooth the transition between sections- if it’s more than 1/8″ off, I’d be a little concerned… otherwise, just make sure both sides of the corset end up even. 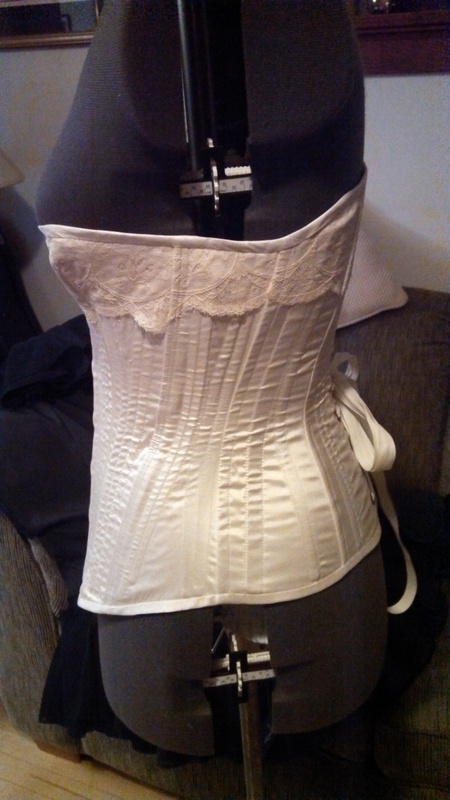 Did I mention I decided to use some lace from a vintage slip on the top of the corset? A little measureing, placing, and there you go. 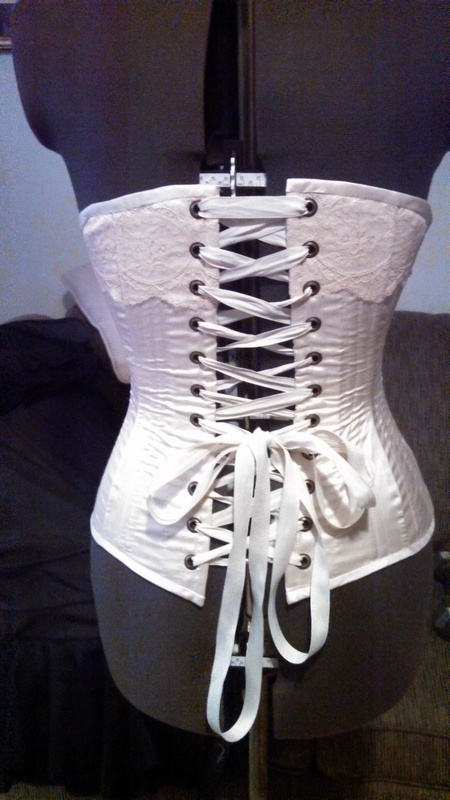 I opted for adding some some decoration to the top of the corset, so I took a half hour out to seamrip the lace off the slip, iron it and lay it out…. placement isn’t perfect, but I was working with a pretty small amount of lace. An overall view of the front and back before adding the busc and grommets. I get caught up, and I forget, but here is at least a picture of the placement for the knob side. I always use an awl to make these holes, gently, to keep from cutting any threads and causing fraying down the road. If it looks like that still may be a concern, sometimes I’ll add a drop of Fraycheck- be careful with this, as the drop can spread and darken the fabric it touches. You may have to work the knobs through the holes- be patient, it’ll be worth it. Two part, quality grommets are *very* important…. these, with the flat edges, won’t cut into your fabric like some cheaper grommets can. There is a school of thought that the more grommets you have the better. I have found that marking 1.25″ apart (making grommets approx. one inch apart) works just fine. I lace myself tightly, but I don’t “tightlace”, so use your own judgment… more grommets can’t hurt. The last should be 1/4″ to 1/2″ from the top and bottom- you don’t want the grommet past the edge of the boning. Finished seam detail on the partial bust cup. Matching scalloped edges is a b****, by the way. Ah well. 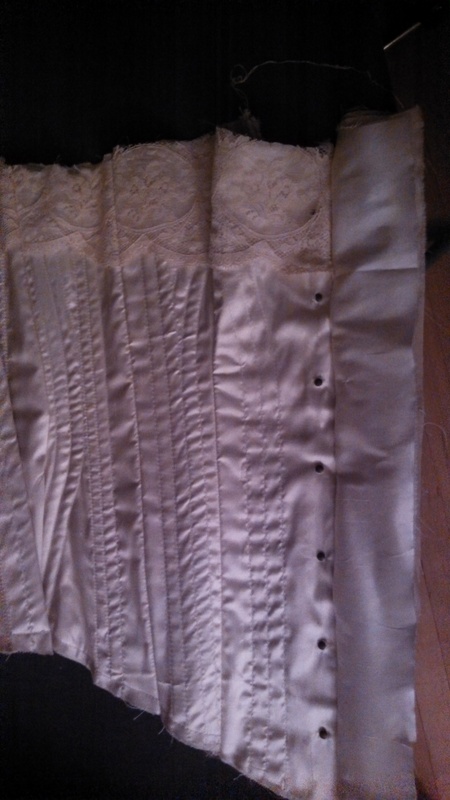 Add in another half hour to cut and iron some bias tape out of the silk, for the top and bottom edges of the corset. 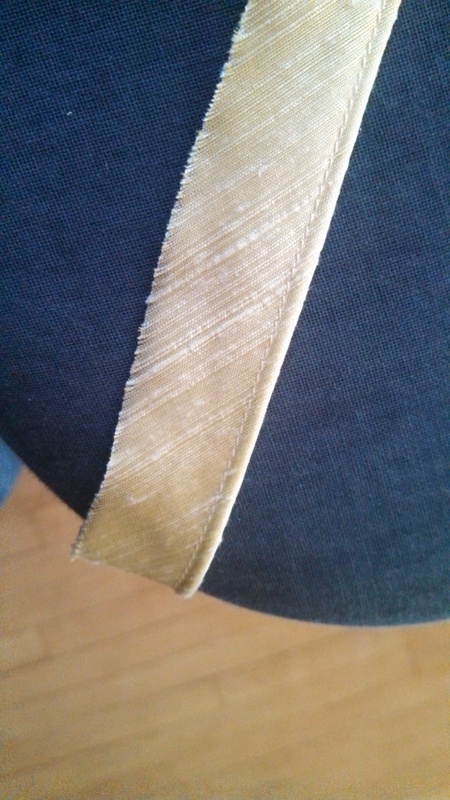 Here you can see the bias tape edging and the finished seam of the interior. 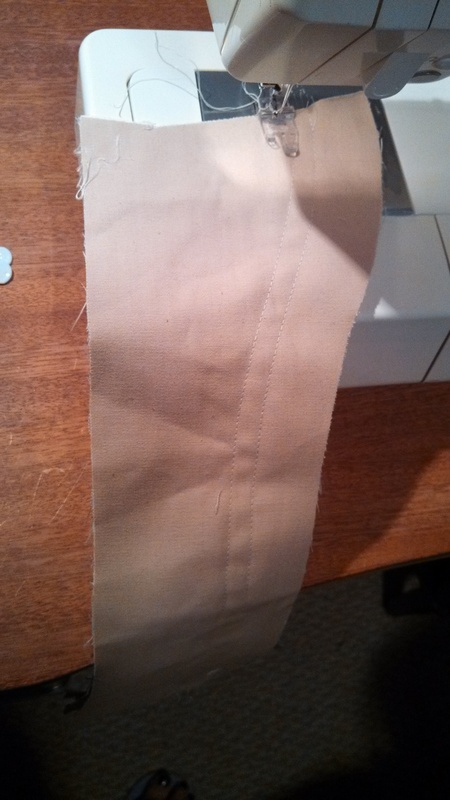 The bias tape I sew by machine, right sides together, then fold it over the back and handstitch it down. 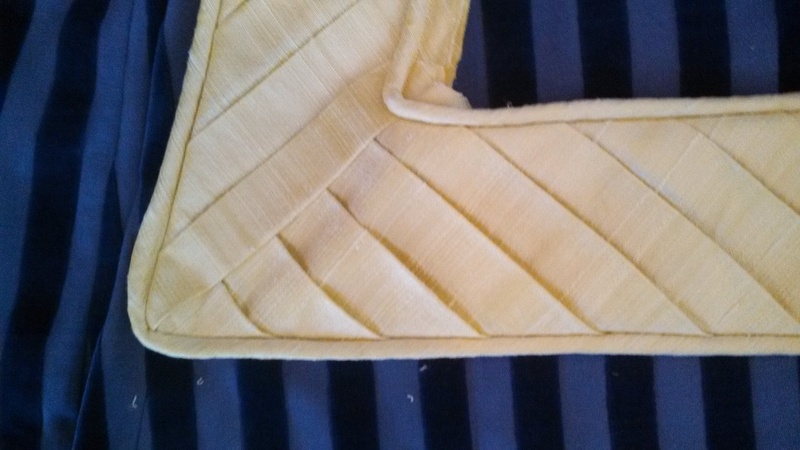 The seams were cut narrow and gone over twice with a zig-zag stitch. Note that the waist is a little short- If I had taken more time with the mockup (no, I didn’t even take pictures) I could’ve avoided that. Back view- I’m very pleased with the higher back, though the pattern had an option for a lower one and I was debating which to make. 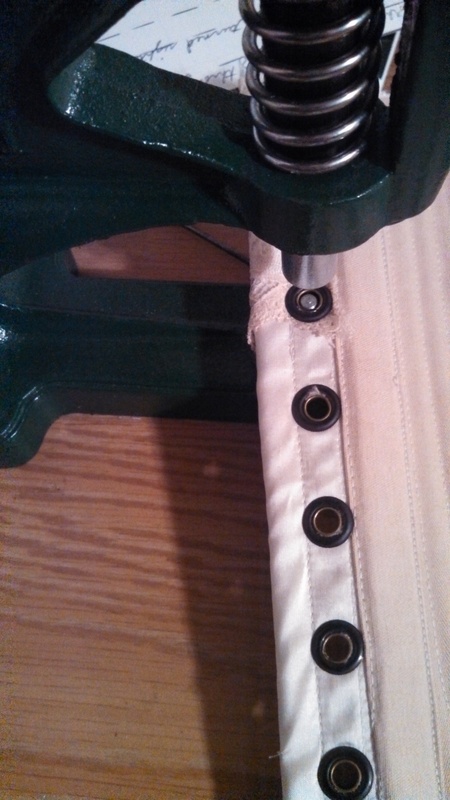 PS- You can see that you get plenty of support with 1.25″ spaced grommets, thanks to the boning on either side. Again, you can see the bust is too low. This is a common problem with vintage patterns- not just corsets- that they tend to be short waisted. So I think my experiment was a success, but I’d add a caveat here- take your time with the mockup, because vintage patterns can have all sorts of idiosyncrasies! Now, as promised, The Fun Stuff. The trims and decoration are what takes a well fitted jacket and a six gore skirt and transforms them into something that gets salivated over & repinned. But trims *usually* also take a lot of planning. For example, most of the decoration on my outfit (that I’ll be referencing today) needs to be applied by hand and includes 2 different sizes of handmade silk piping. 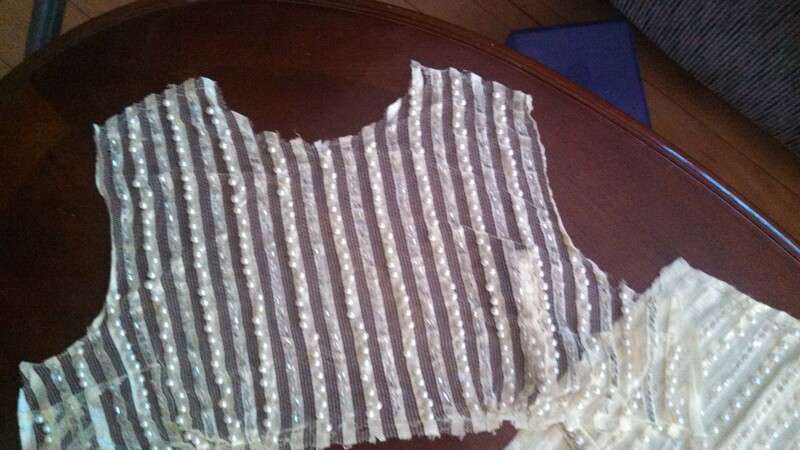 Beading- The shining star of my decoration will be the beaded and pearled perfection of a repurposed vintage shirt. I cannot tell you the work and expense that recycling vintage finds has saved me… and it cuts down on waste. The color of this shirt is really the inspiration for the outfit- this pale, gentle yellow paired with a deep, nearly navy, blue. It says “French”, without screaming “FRENCH! !” If you know what I mean. I’m using the fabric as the center panel of the bodice and as an accent at the bottom of the flounce in back. The lines will echo the stripes and inverted V’s in the primary pleating and in yellow velvet ribbon accents on the sleeves. Once the shirt was disassembled I could really see the size of the pieces I would have to work with. After reinforcing all the pearls because they were chain stitched 😦 I backed everything with two layers of silk. More Beading- I’m harvesting the beads and pearls from castoff bits of shirt and working it into the decoration on the lapels, cuffs, hem…. and purse and shoes. To make a guide for beading the lapels and sleeves, I marked 3 evenly spaced right angles with chalk, and stitched on a bead every 1/3″ for a decorative look that echoes the lines of the dress without being too time intensive. The beading I did on the turned down cuff. The beading on the collar. Even More Beading– So, after I had the box pleated hem made, I decided I needed to cover up the line of stitching that held the pleats down (and eventually the stitching that will attach it to the dress). 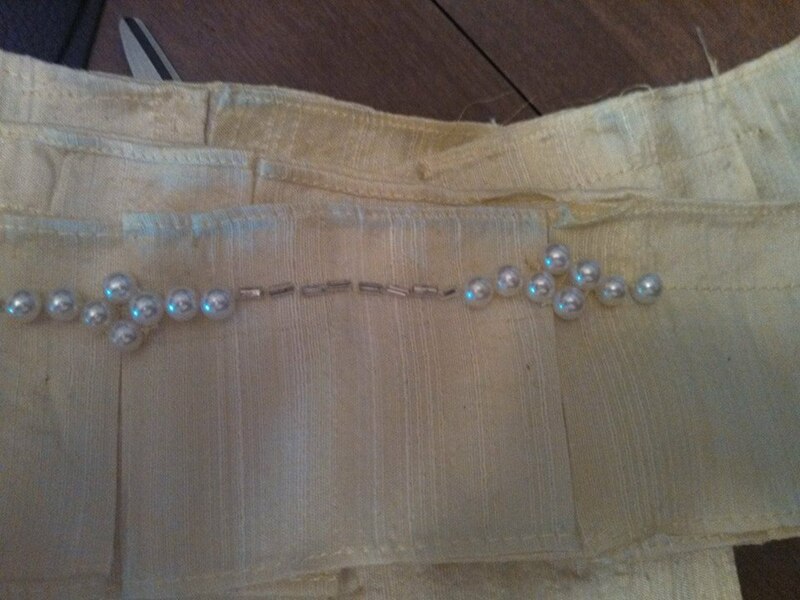 I had allll these extra beads and pearls, so naturally I decided to hand bead the hem. (Oy) I found that a backstitch worked best, and feels pretty stable. 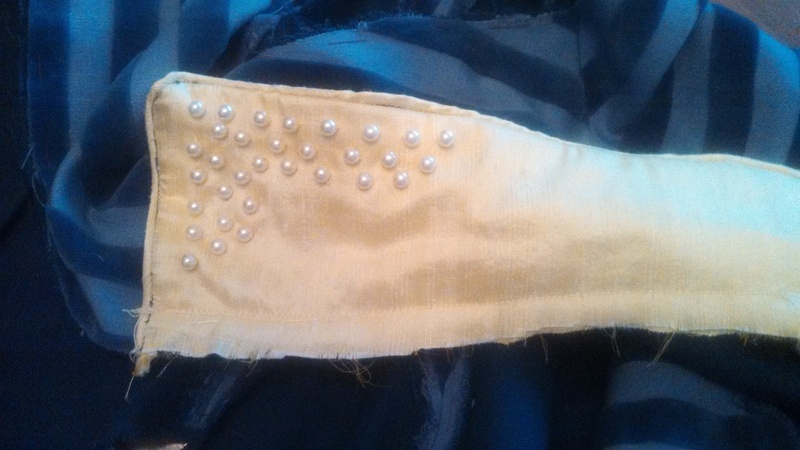 Once the beading is done, the hem will be attached with stitches hidden along the beaded area. 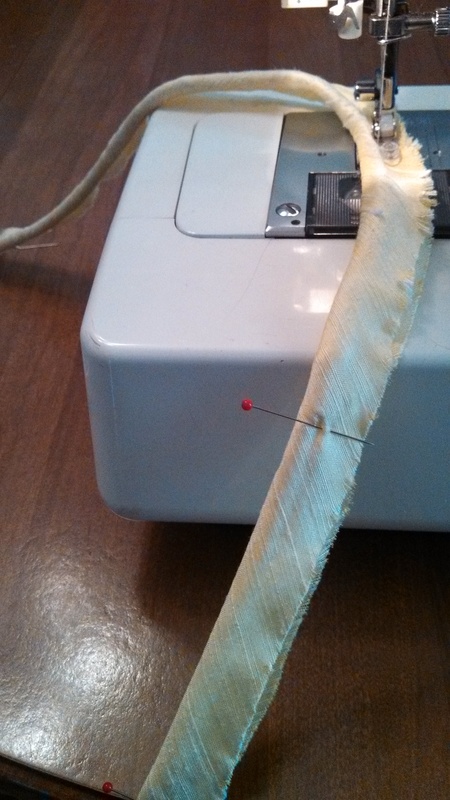 Box pleated hem (1/16″ hem on the strips) starched and getting beaded. 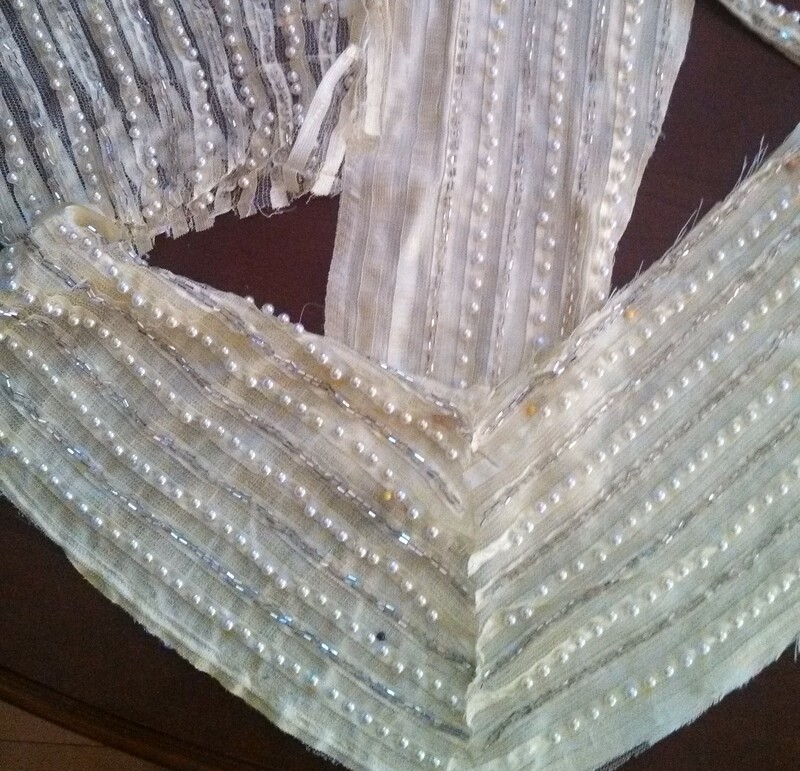 The pearl cluster is sewn in a circle beforehand, then the circle of beads attached at the intersection of each pleat. Pleating– The primary pleating, that I farmed out to my marvelously talented and patient friend Michelle, of Envy Rae Designs, is a 45 degree angle pleating running along the hem and up the back of the skirt on either side of the silk train. I knew what I wanted, I just really didn’t want to do it. 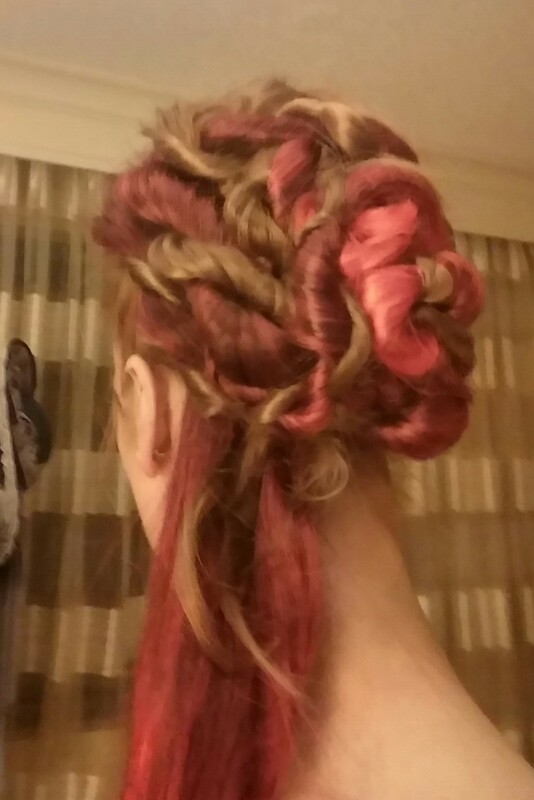 And it turned out beautifully! I attached the larger piping to the edges and then stitched it onto the skirt. 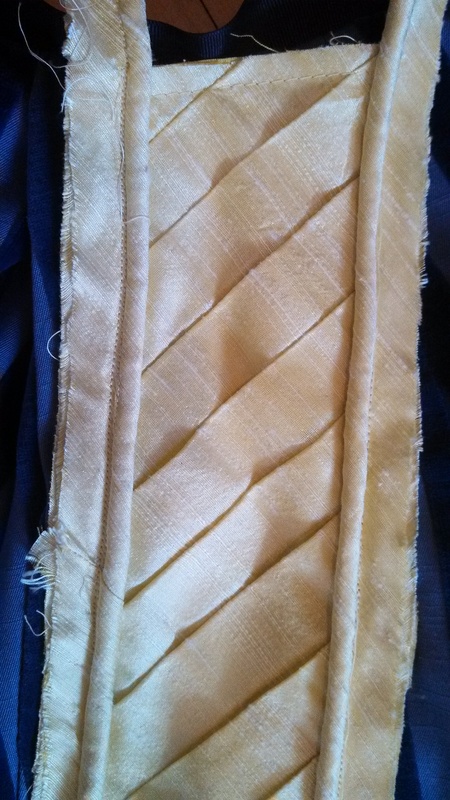 Large piping sewn at corners of angle pleats. 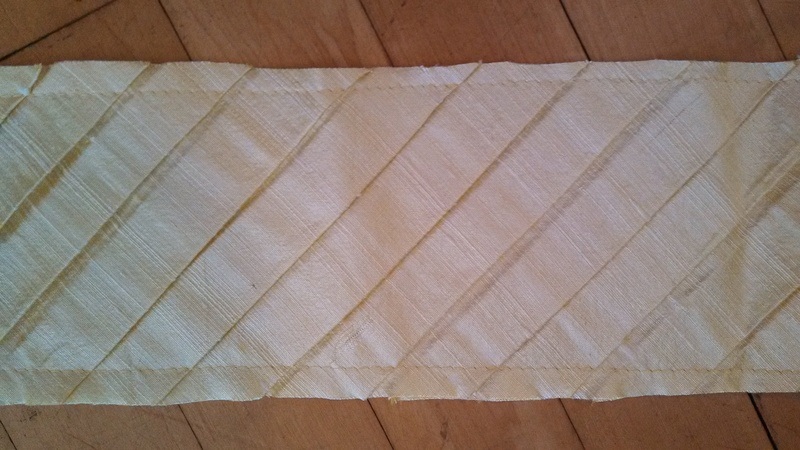 45 degree angled pleats, backed with yellow cotton. 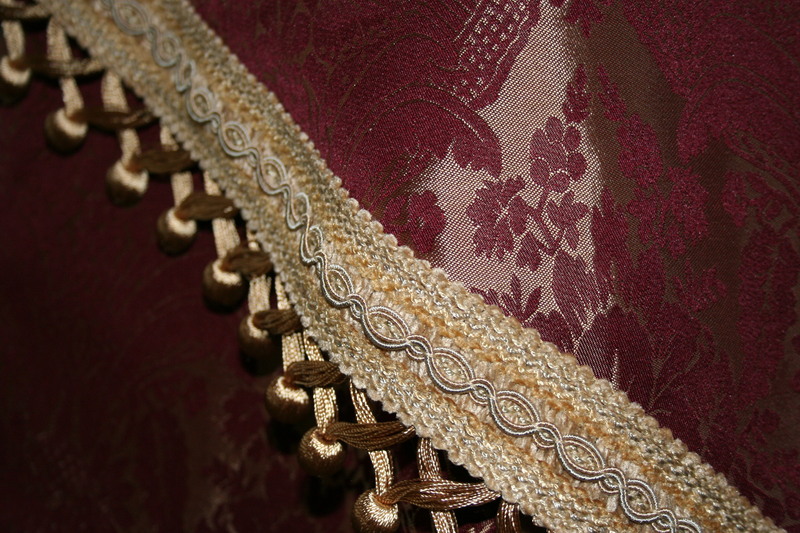 A view of the skirt pleating attached… and the attached beaded bits at the cuffs and jacket back. Piping– I made 2 sizes of piping because I decided that a larger size would be too bulky round the neckline and cuffs, but a smaller size would get lost amid the larger skirt features. Then when you have a very long strip of bias cut fabric, wrap it around the piping cord and use a zipper foot or something similar to sew as close to the cord as you can. *The bias cut is important, it allows your piping to move around corners and curves with ease, without distorting your fabric.To attach the piping to your outfit, it needs to be sandwiched between the lining and the fashion fabric. You’ll want to line it up pretty carefully- wavering lines will show here when you turn it all right-side out! I suggest using a thread color that matches your piping, and again you’ll want to get the needle as close to the edge of the cord as possible. Now, you could try sewing through the three layers, but what I usually do is to lay the piping on the right side of the fabric- with the cut edge of the piping facing the cut edge of the fabric- and stitch them together, adding the lining on top afterwards for another round of pinning and stitching. It takes a little more time, but it’s less stressful than trying to manipulate three layers at once, wondering if the piping is moving around in there where you can’t see it. Placement of piping- the lining will be placed on top of this, sandwiching the piping in between, with the cord always toward the inside. Turned down tabs-These are relatively easy, I planned to take the squared corners of the jacket and cuffs and turn them out at 45 degrees to show off the lining and to echo that chevron shape again. The only extra consideration I had (after I had the collar all put together!) 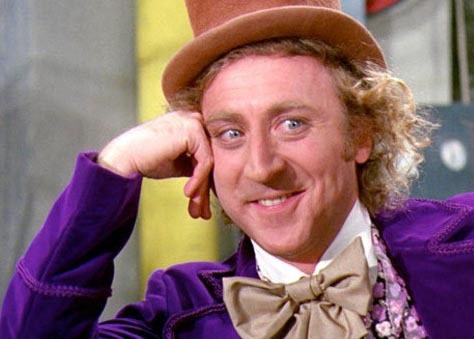 was that the silk lining would have to be doubled because you could see through a single thickness. 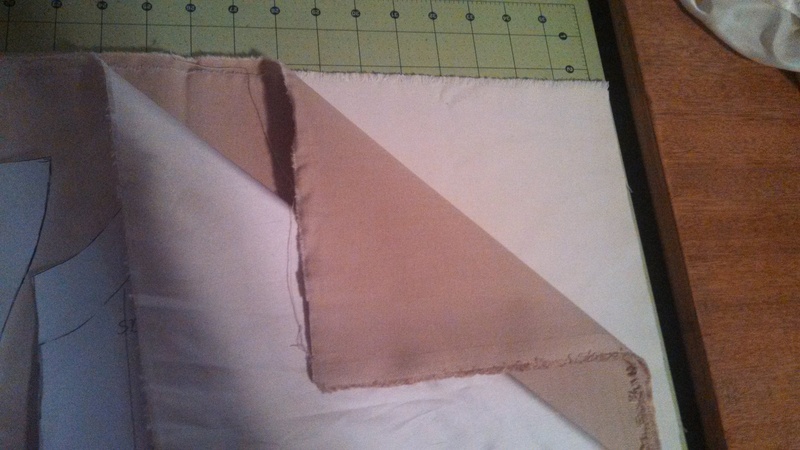 So I cut 4 lining pieces for the cuffs, lapels and a couple of 5″x 5″ squares for the lower corners of the jacket. I placed a covered button at the center of the flap, and it makes for a nice, period look! I echoed the turned down tabs at a few points on the outfit. 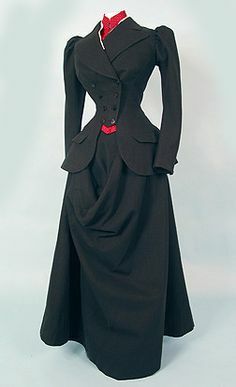 The tabs on the skirt (not shown) and at the bottom of the jacket are “held down” by covered buttons. Challenge 1: I want the Vs placed on the outside of the arms, but that isn’t centered on the two sleeve pattern pieces. What I did was pin the ribbon where I wanted it on the mock-up (another bonus to making one) and mark the lines of ribbon in chalk. 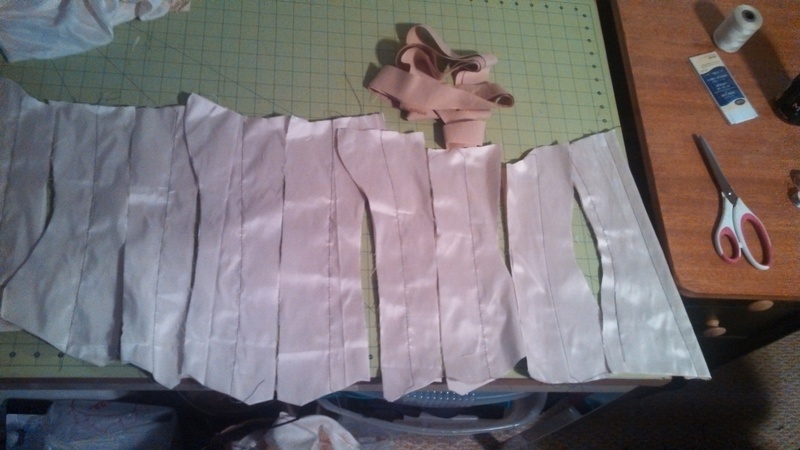 Then I took the sleeve off, took out one seam and cut slits along the marked lines. Then, placing the mock-up over the actual sleeve- with only one seam stitched- I used a chalk pencil to mark on the good fabric along the slits in the mock-up. Then I had exact placement for the ribbon. 1. Mark the top of the shoulder on the sleeve, then remove the sleeve from the mock-up. 2. Leave the outer seam in place, seam-rip the inside seam and lay it flat. 3. Mark the desired line placement in chalk. 4. Make some slits along your lines. 5. Lay the mock-up on top of your sleeves (cut out in good fabric and sewn up the outer seam). Mark through the slits to get exact placement of your lines. Lay your trim along the marked lines and pin. 6. Attach. I tested machine stitching on a scrap and liked it… good to go. 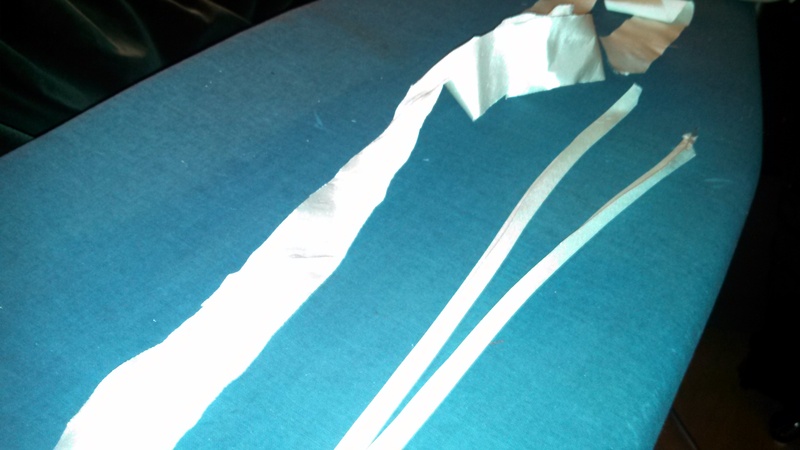 Challenge 2: How to attach the 3/8″ ribbon to the fabric. Fabric glue, in the past, sometimes can leave dark spots if you don’t get the amount precisely right, so gluing was out. 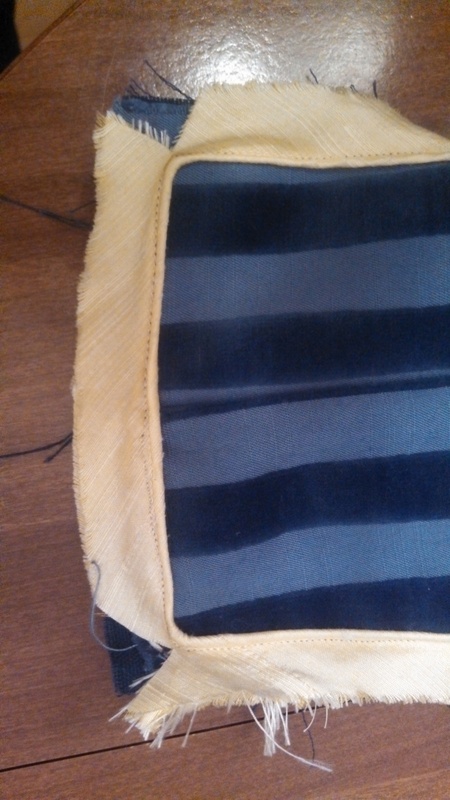 I considered 2-sided interfacing & ironing, but cutting strips that narrow and keeping the interfacing from getting all over would be a mess, and the velvet would have to be ironed from the opposite side, making the task nearly impossible. I – briefly- considered doing tiny little baby hand-stitching up and down each side of each ribbon, but decided I’d rather stick something sharp in my eye. 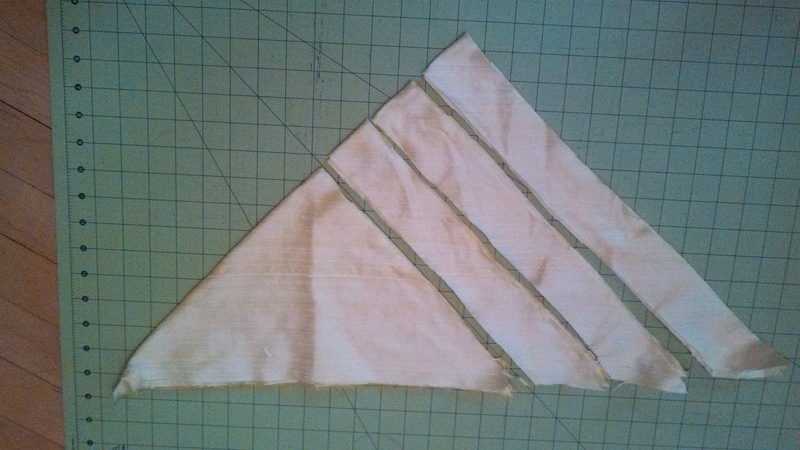 So I did a test sample to see what machine stitching along the 1/16 edges would look like. It was a success, but I’ll point out here that a machine with an adjustable stitch speed was very helpful here! 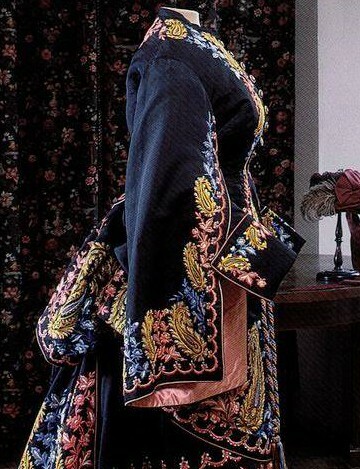 The very last aspect of decoration I did- the waterfall pleated train- is really more of an overall design choice, so it will be covered in the next post, where I’ll talk about the style choices, and who would be wearing this dress, and where, in the Victorian Era. I swear I will write it before Teslacon! Two weeks ago in Milwaukee at the Public Museum I was thrilled to be a part of a fashion show… one that was probably unlike any other you’ve seen! “Paleontology of a Woman“, hosted by Timothy Westbrook, was a dinosaur-inspired fashion show, and held in the rain forest section of the museum with an exclusive 200 seats available (plus some standing room only spots opened up due to demand). You can check out Timothy’s sustainability-driven message and aesthetic at his link above, and get info on all the other collaborators on the POAW website while it’s up. 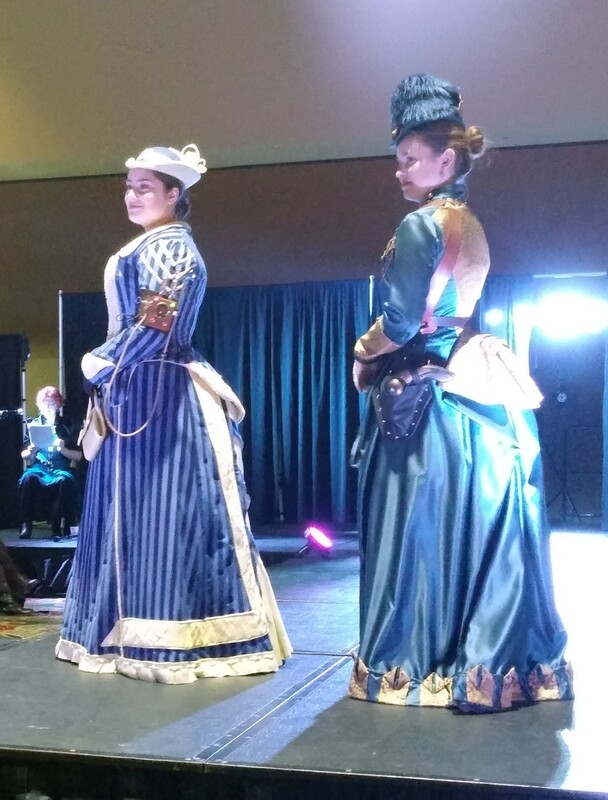 And among the 14 total looks shown, three of them were my Victorian inspired designs! 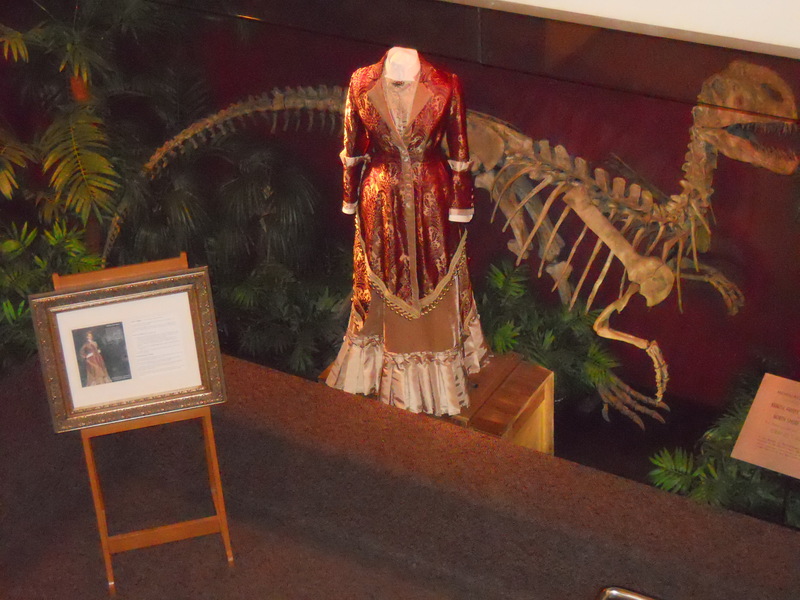 An additional look was featured at the point of entry for guests, posed with a Velociraptor skeleton. I was only one of many collaborators involved in the show, and I have to say I had a fantastic time seeing so many people come together for such a unique show. I’ll post a couple photos below, but there’s no point in reinventing the wheel when there have been multiple articles, a very thorough blog, and even two videos posted on the show. Thanks to Timothy for the opportunity, to the other collaborators for being wonderful, to my models for having the class to carry off these gowns, and to my assistant Lina Pashkova for being at the ready all night! My award-winning burgundy and bronze gown. And a Velociraptor. My lovely models, looking lovely in my gowns. Left to Right: Courtney, Anu, (me) and Marissa. 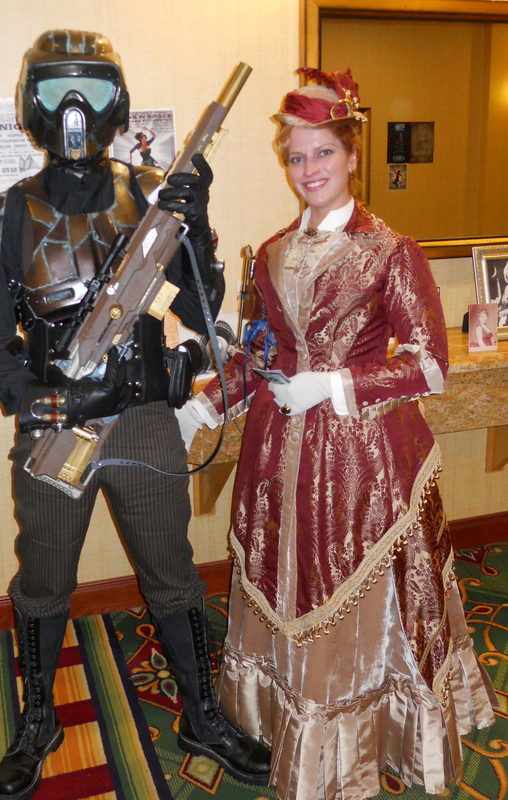 PS- Yes, my next blog post on the Teslacon Dress is coming, it’s mostly written & really just needs pictures!